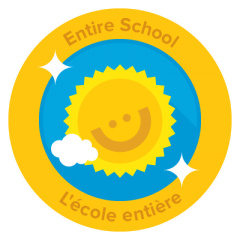 R.H. Murray is an active country community school that provides a healthy morning snack and a physical Spark exercise program daily. 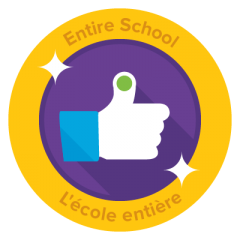 We have 103 students that practise healthy growth mindsets with the power I can. We have various sports teams to enhance healthy experiences for our students. We continue to explore various avenues to promote the well being in our students. 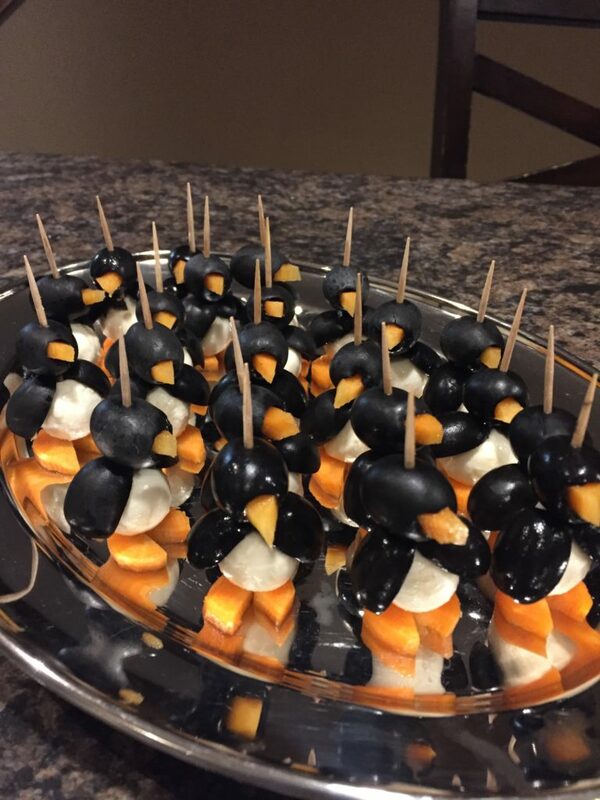 The Kindergarten class assembled some penguin treats made with carrots, cheese, and black olives. They were served on ice. So cute! So creative! What a fun yummy treat for us teachers! We loved them!! Bright Bites it has been so much nutritional fun being part of this great program to raise awareness of healthy eating with our Muskies. We certainly did a lot of healthy eating!!!!! THANKS!!!! 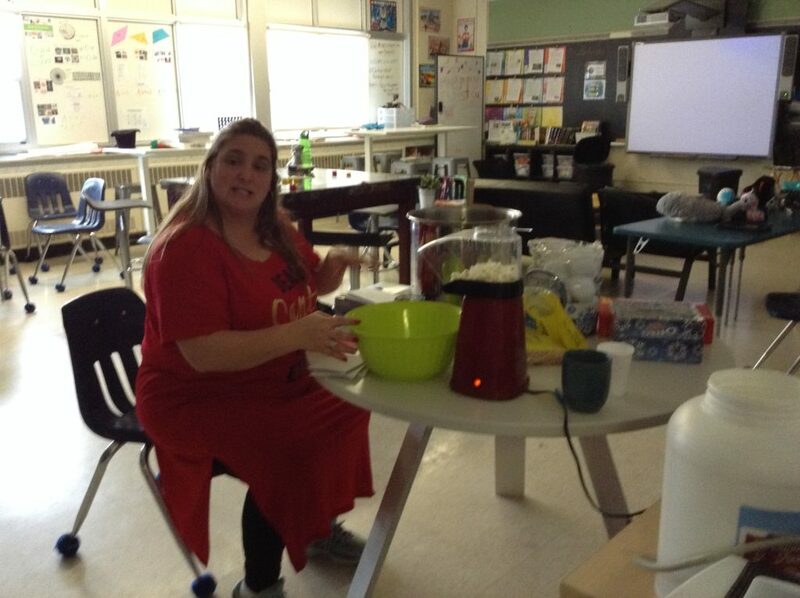 Mrs. Oshell cooked up a storm in her classroom today too! 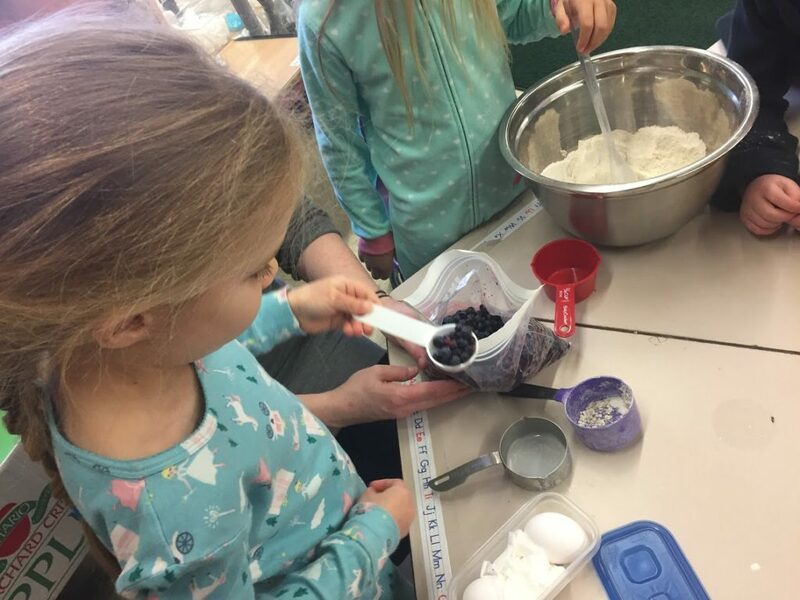 The students made fresh blueberry muffins. 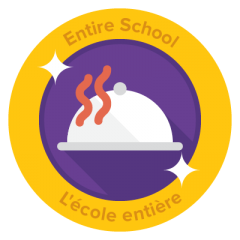 With all this cooking today the school was filled was such great aromas! Way to go little ones. Bright Bites include biting into a fresh blueberry muffin!! The Murray Muskies were treated to some seasonal serenade by our local musician from the Sudbury Symphony Jamie Arrowsmith today. Such lovely music to munch by. 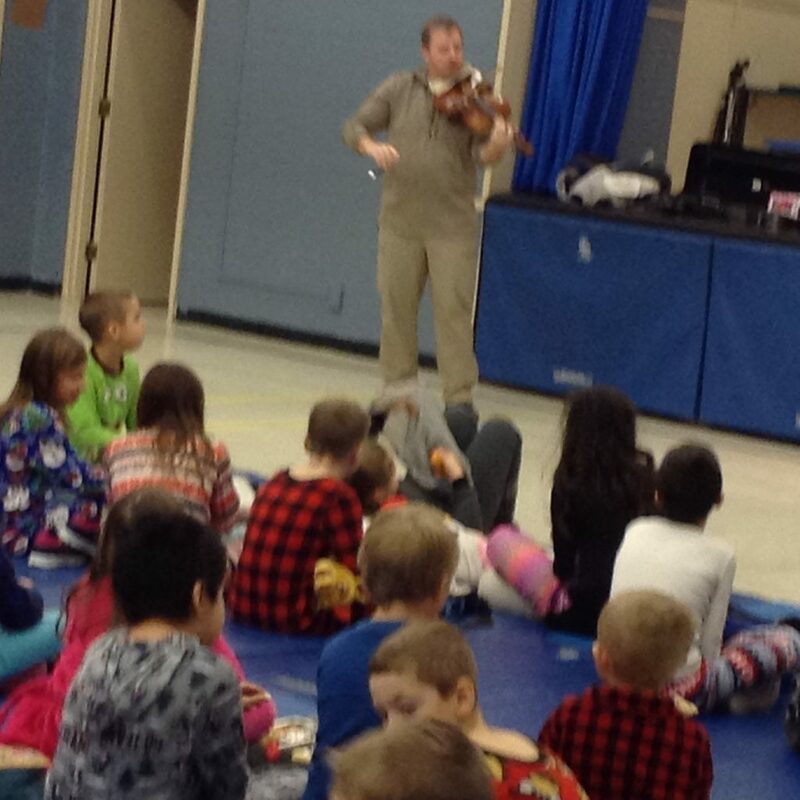 The violin was enjoyed by all our muskies while having a picnic in the gym. Thank you so much Jamie! We loved the Christmas string medley! Cook It Up! No! Pop It Up! Big shout out to Mrs. Neva for popping some healthy corn for us all to munch on while watching the movie Arthur’s Christmas today! It was delicious! It hit the spot! The season is here for cooking up a storm here at R.H. Murray P.S. 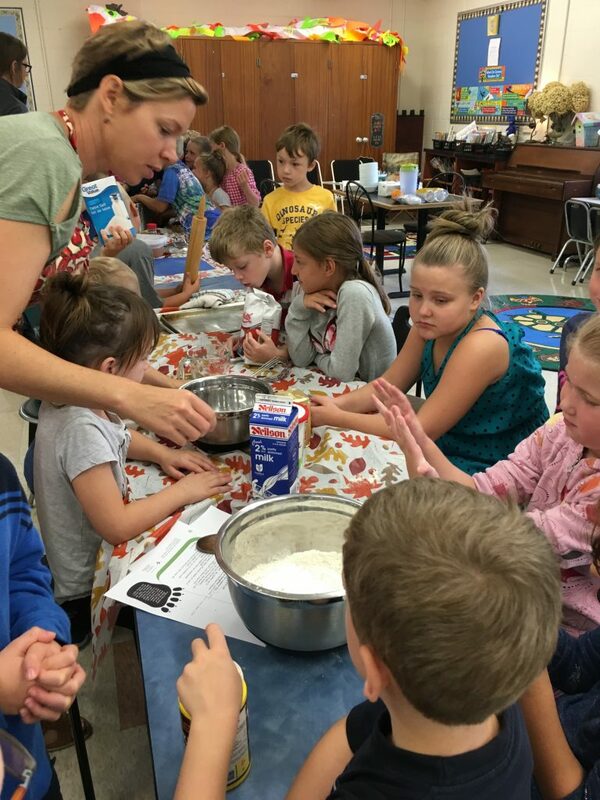 Students in Grade 1/2 cooked up some applesauce to go with their latkes. Of course it was all gobbled up. The best thing is the only ingredients used was fresh apples and a bit of water. No sugar!!!! 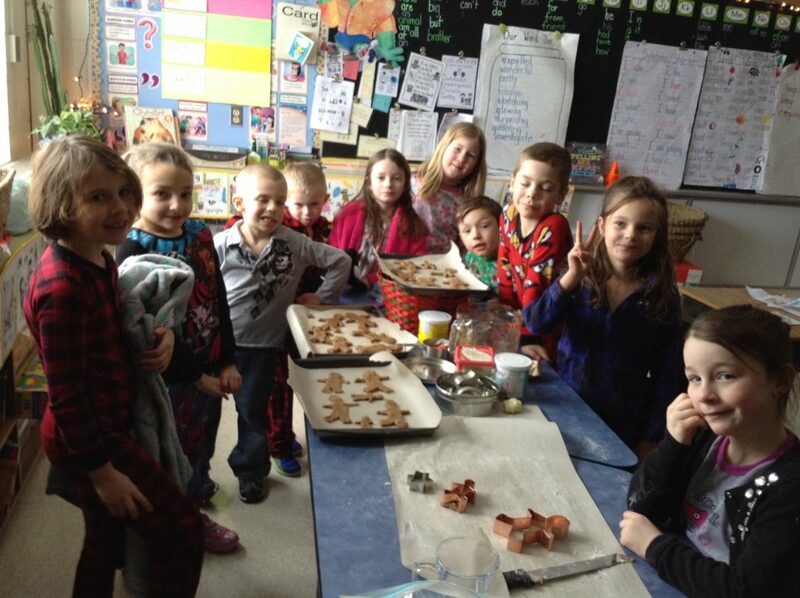 The Grade 1/2 made gingerbread cookies with a twist! We put chunks of fresh apples in the dough. They turned out just yummy! Great idea little ones!! 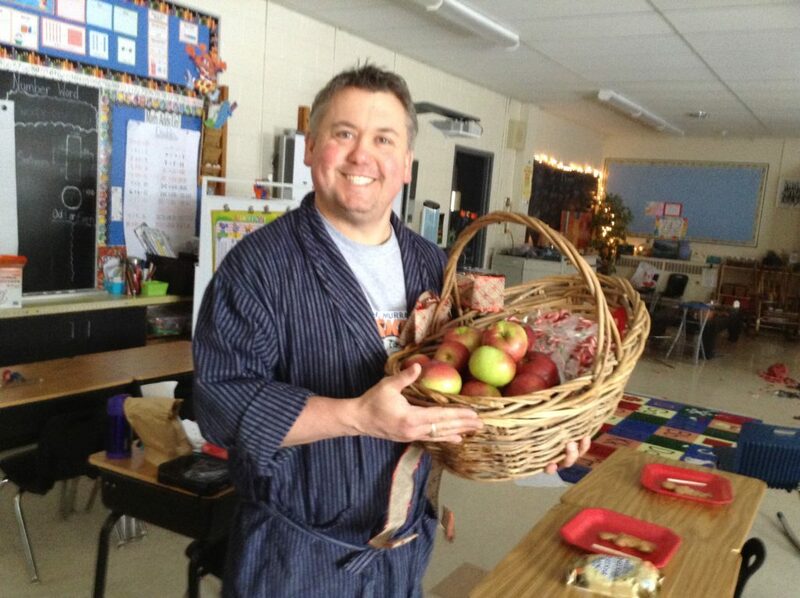 Mr. Dewit walked around the school offering candy canes and apples. Students were asked to take one of each! Tis the merry season to try and stay healthy. Bright Bites sure has changed life here at R.H. Murray P.S. 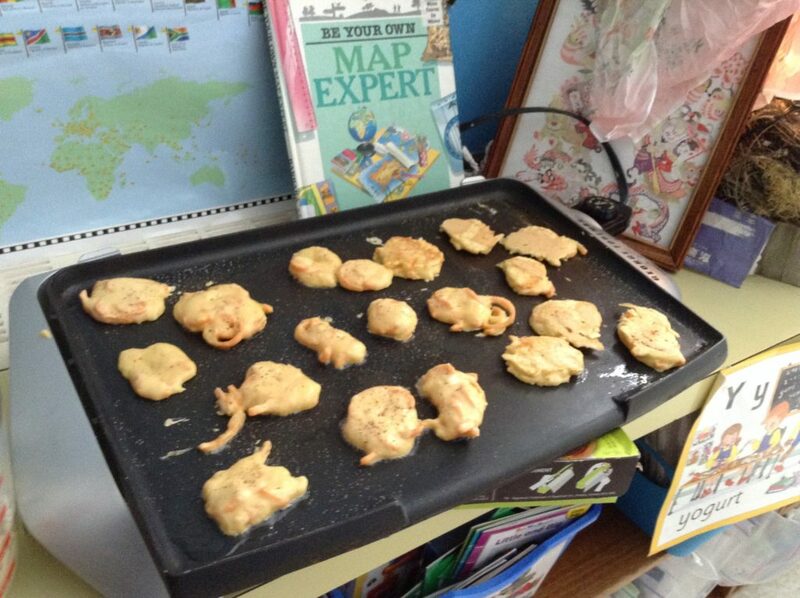 The Grade 1/2 helped Mrs. Salo make sweet potato latkes. We also put grated white potato in the batter! The students enjoyed tasting these Jewish Hanukkah treats! 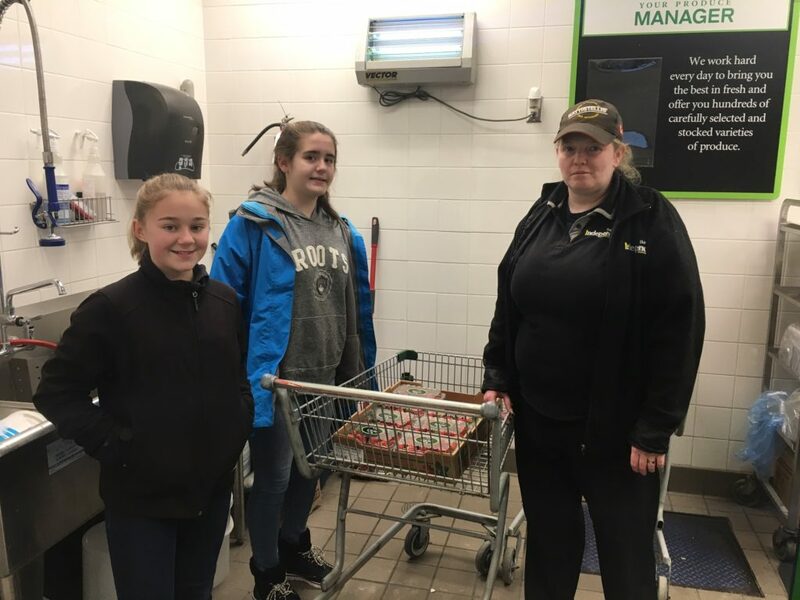 The Murray students visited the local grocer store and instead of receiving a free cookie, children are able to grab fresh and clean fruit to eat. 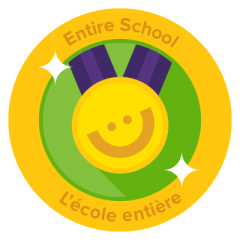 Our students are part of the Healthy Kids Club. 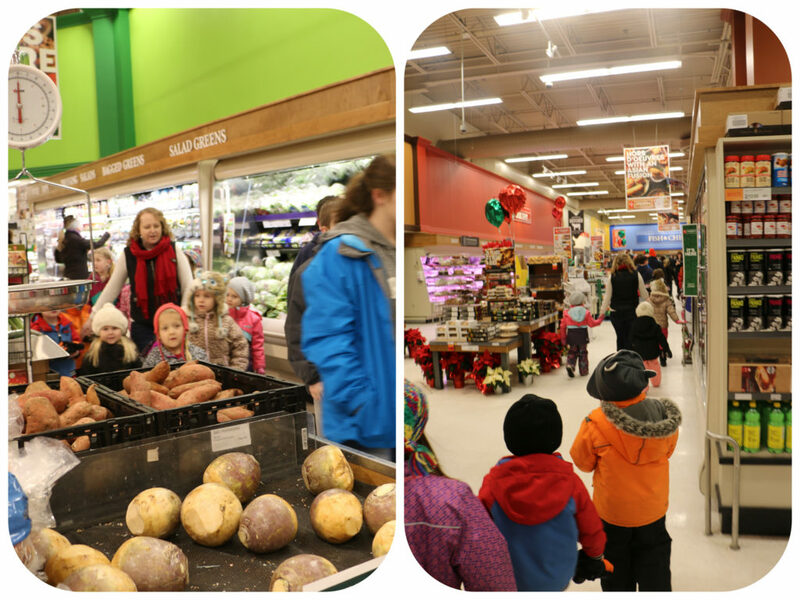 Students drew attention to the importance of shopping the perimeter in the grocery store, by spreading holiday cheer by carolling. 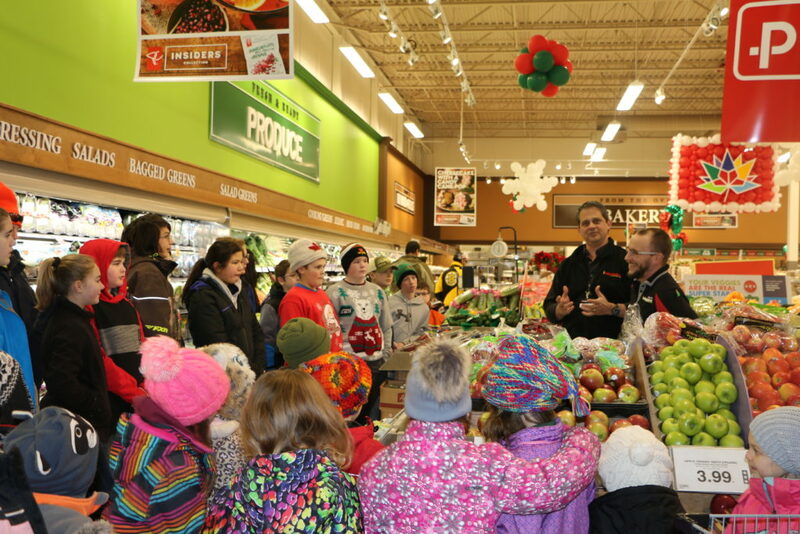 Customers enjoyed the healthy explanations and comments provided by our students as they sang. Did you know that the salad bar in our local grocery store is the most popular department and continues to grow in order to meet the demands for a healthy “fast food” option. 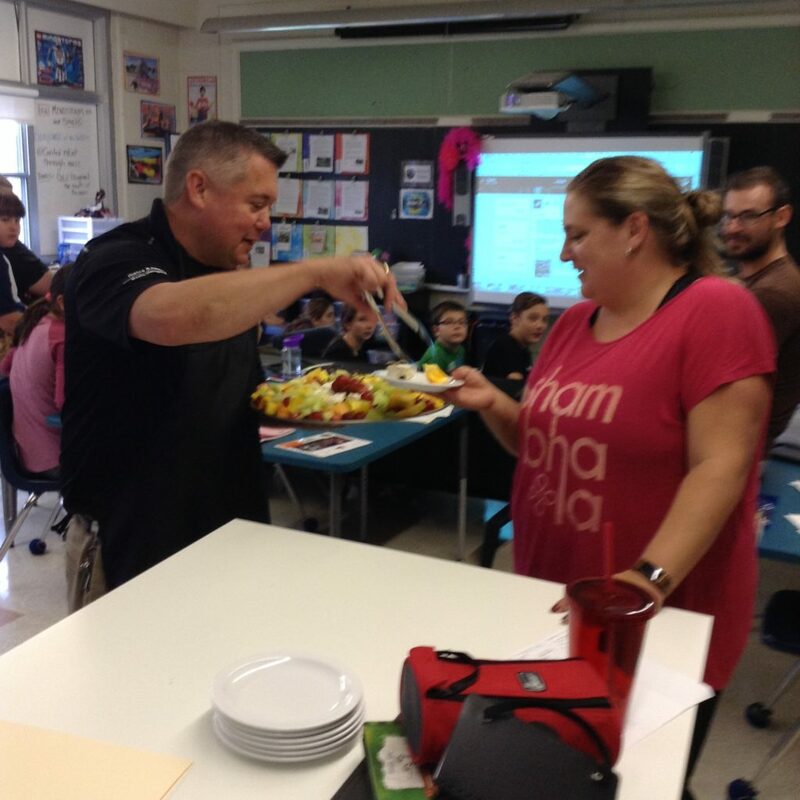 Grade 7/8 students in Mrs. Neva’s class interviewed the salad bar barista on preparing a variety of delicious salads. 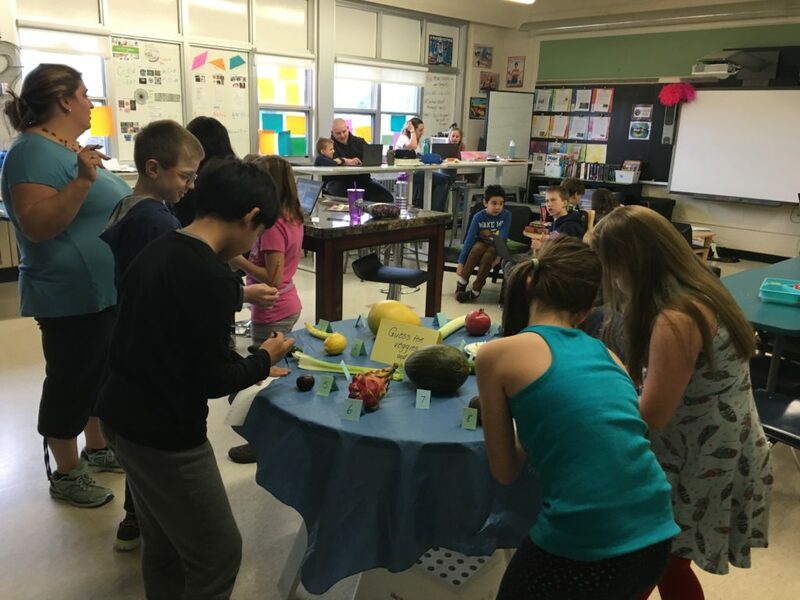 Mr. Battistelli informed students about the variety of fruits and vegetables available to our community during a recent visit. 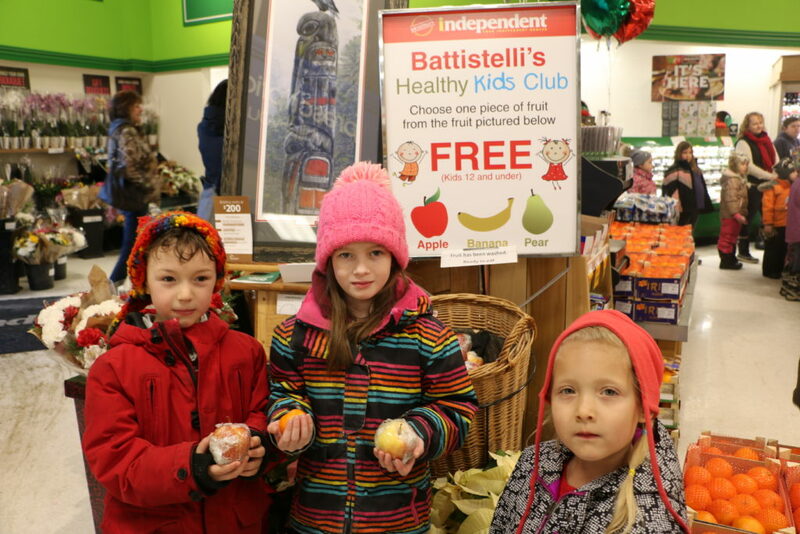 We also wanted to show our appreciation for all of the community support that Battistelli’s Independent Grocers provides to RHM. The intermediate volleyball teams challenged the RHM staff to a few friendly volleyball games, as classes cheered everyone on. The RHM staff was triumph in all of their games. Coach Mike rehydrated the students with cold water after all of their hard work. Lunch supervisors overheard intermediate student chatting about the nutritional facts about their lunch items, especially the sugar content. 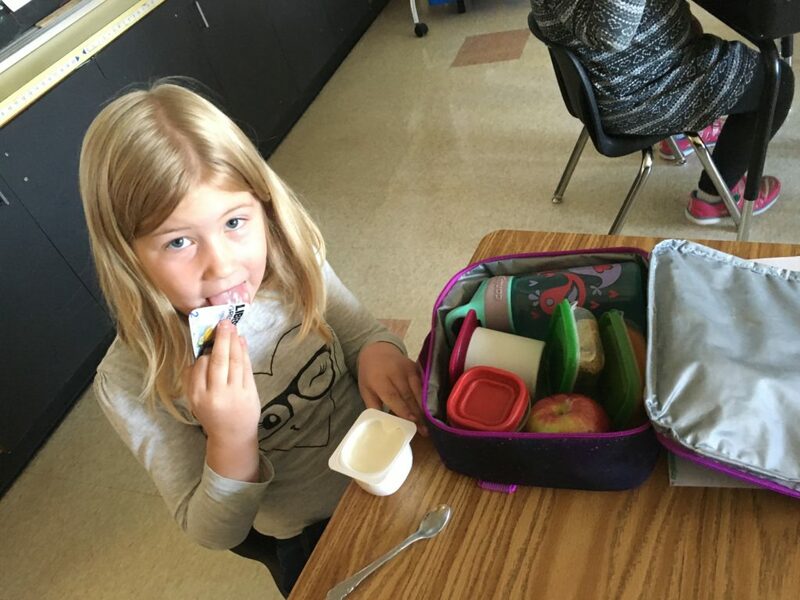 Our continued healthy eating initiatives are making strong connections in our students daily life. 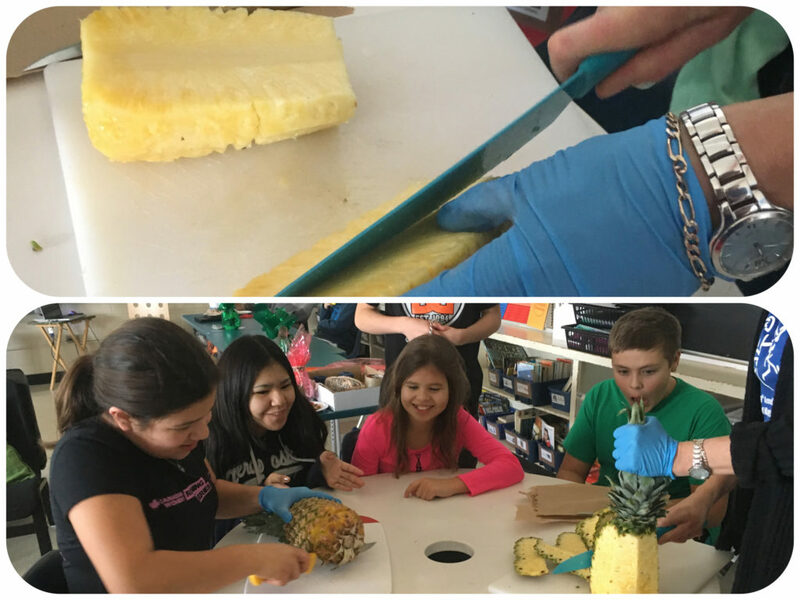 Parent demonstration on how to easily and painlessly cut up pineapple in order to maximize the health benefits by eating the core that holds most of the vitamins. Also, students learned to easily cut a mango in order to minimize the waste of the precious fruit and make it aesthetically pleasing to the eye. We called them mango flowers! 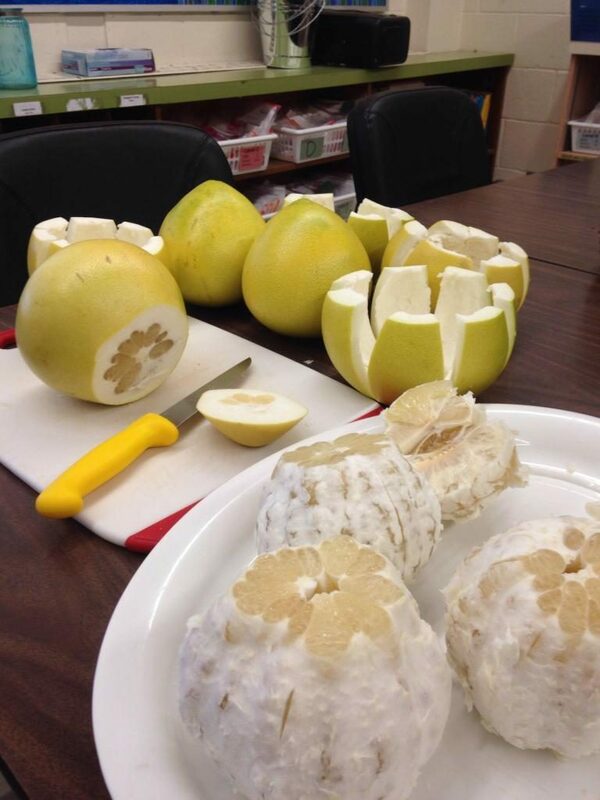 Thank you to Ms. Hamilton who learned these skills cutting sub-tropical fruits during her ten years living in Taiwan. 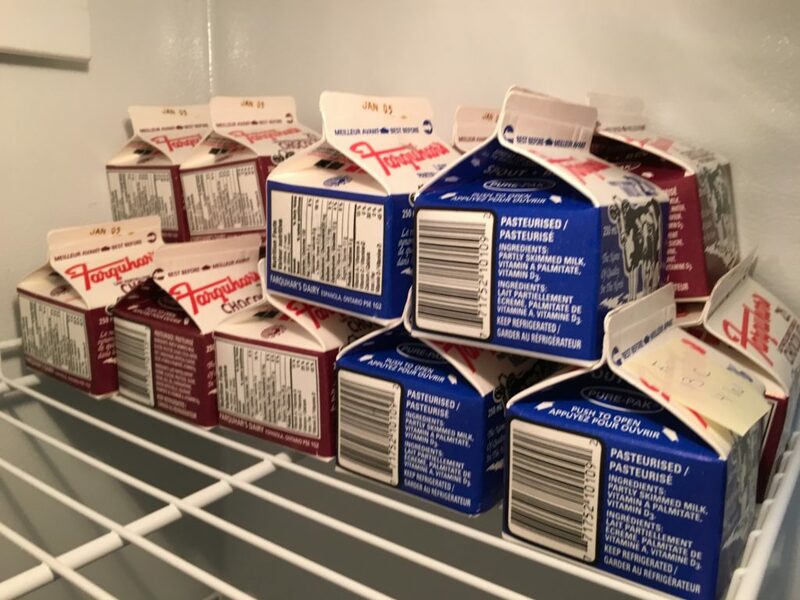 Students are able to purchase white or chocolate milk on a daily basis throughout the school year. Calcium plays such an important role in the development of those young bones! 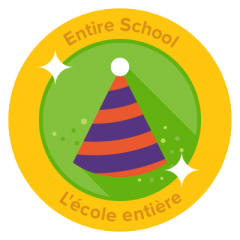 And Here’s to Reading and Writing! Teachers have made an effort to give gifts such as Christmas pencils and writing pads and books instead of sweet treats. Thumbs up to Mrs. Schell and Mrs. Salo! 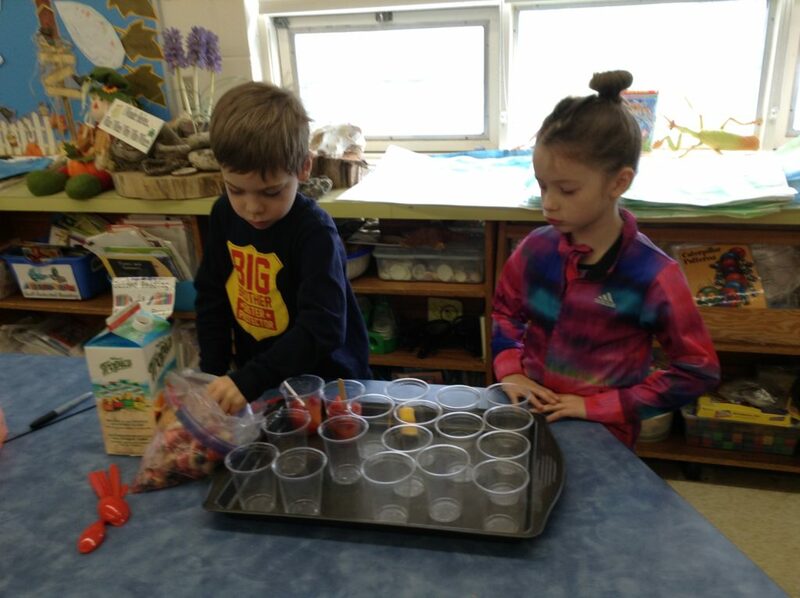 The Jk/Sk used rhythm sticks and fruit notes to make a musical fruit salad. 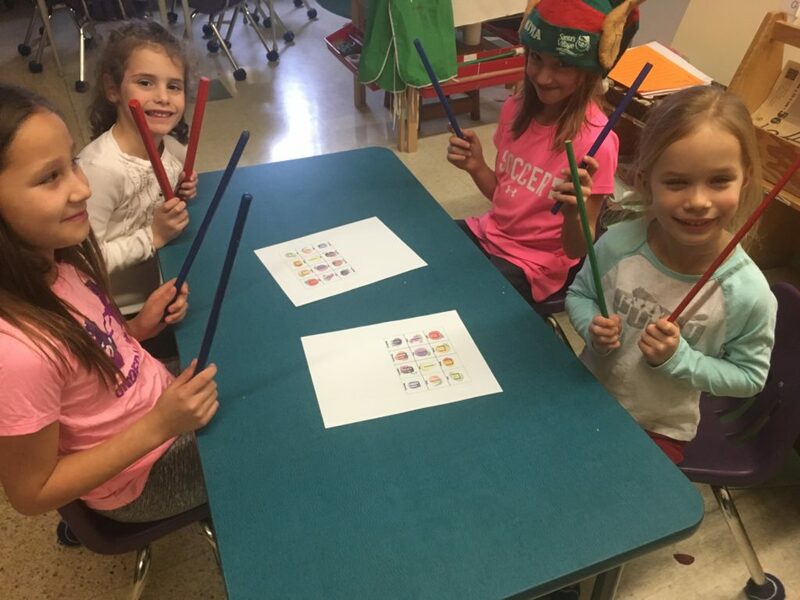 Great music lesson Mrs. Schell! Mrs. Salo made a healthy berry trifle for the staff diner instead of all kinds of sweets. 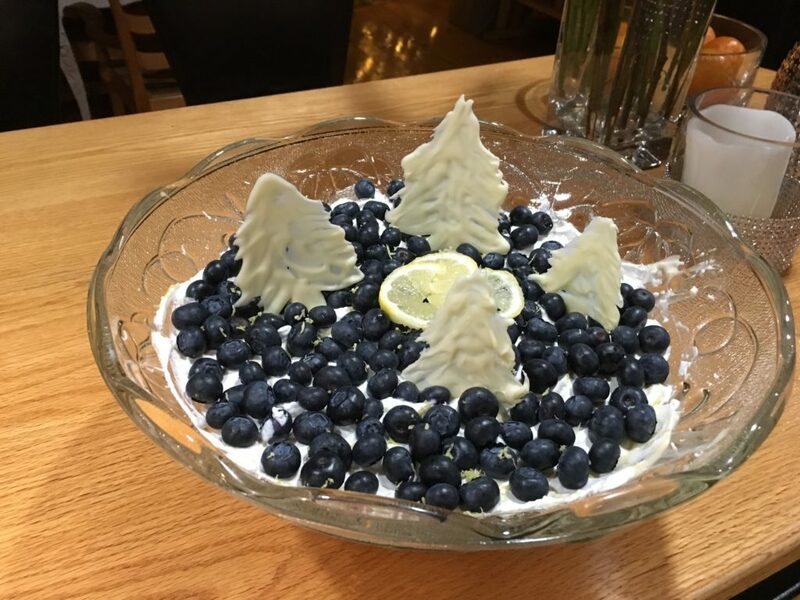 A variety of berries, yogurt , and cream was used with a sometimes food of white chocolate Christmas trees. We loved the fresh blueberries. We had our Christmas Outdoor Concert which included fire warm up stations, Santa’s visit, carolling, students performances, and the largest cookie tray ever. We added some festive apples to keep up with healthy eating along with the sometimes food indulgence. The Snowflake Choir went to Meadowbrooks to bring Christmas cheer to our community seniors. Instead of having just candy cane treats and hot chocolate they were served some nutritious veggies and dip. Thank you so much to Meadowbrooks for jumping on board and serving healthy munchies. Super community that supports our healthy eating goals! 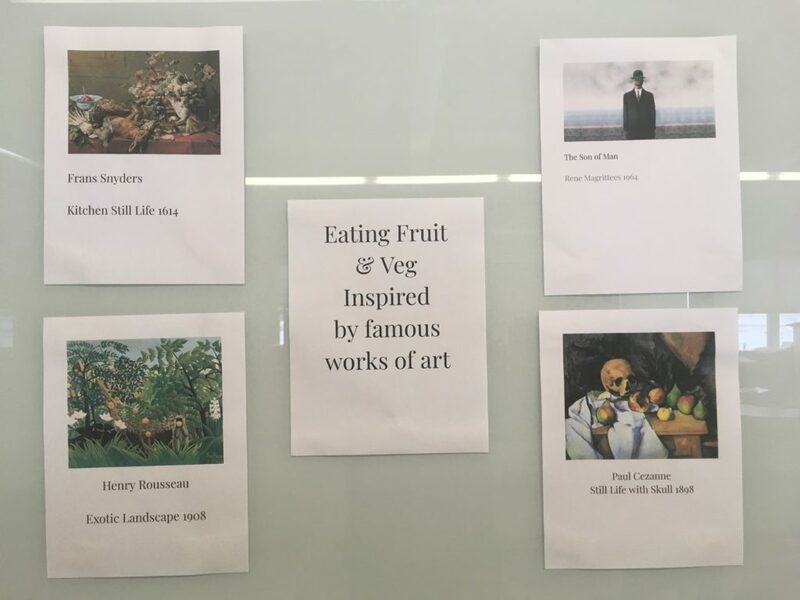 Mrs. Schell posted portraits of famous works of art that contained fruits and vegetables to inspire healthy eating during lunch time with her class. 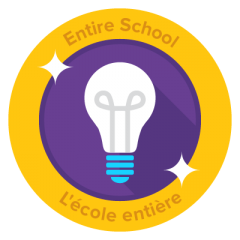 Bright idea Mrs. Schell! Mrs. Hamilton shared a wonderful Chinese tradition with some of our younger Muskies. The students were introduced to Pomelos. They got to taste this big grapefruit like fruit. The fruit was cut in such a way that the peel of the fruit can be then worn as a hat. The students had fun trying them on. Tradition is that it will bring one good luck. Thanks Mrs. Hamilton! What to do with leftover vegetables and turkey? Make a great homemade soup! Hot soup on after our Muskie Skate sure warms one up. 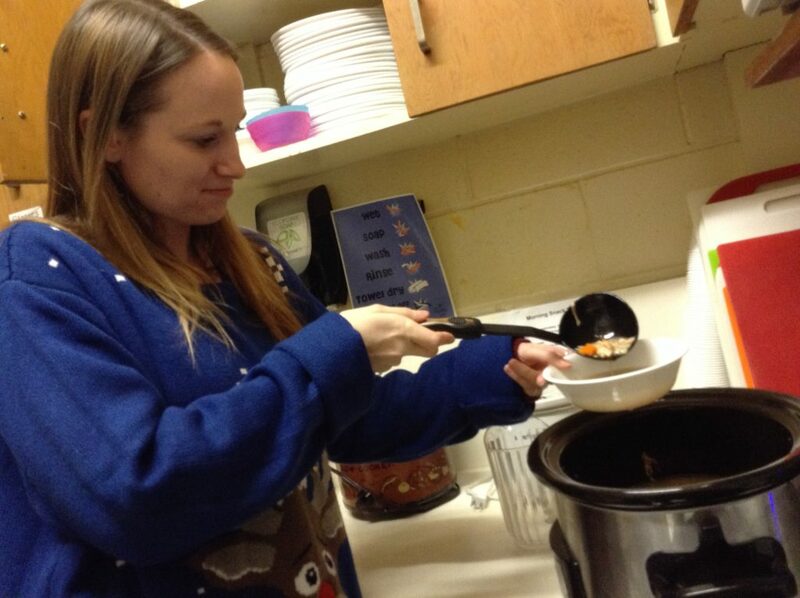 Thanks to Mrs. Schell for making this delicious soup. Muskies are using their creativity to bring in the coolest water container to drink their water in. This canteen came out ahead as a pretty cool one! Cool idea Muskie! 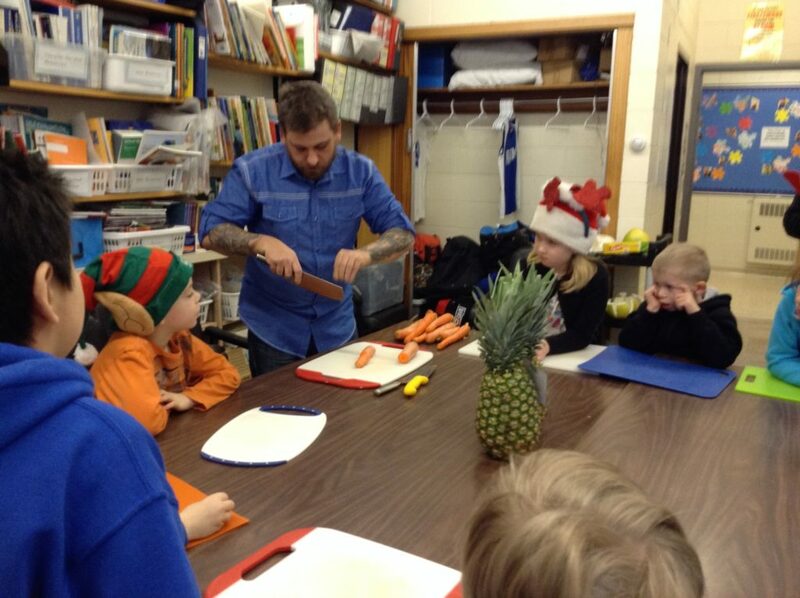 Murray Muskies had a great workshop on how to use knives to cut their veggies and fruits. Thanks to one of our parents who was a chef at Sixth Avenue. There really is an art and some safety techniques for sure when cutting up veggies and fruits. 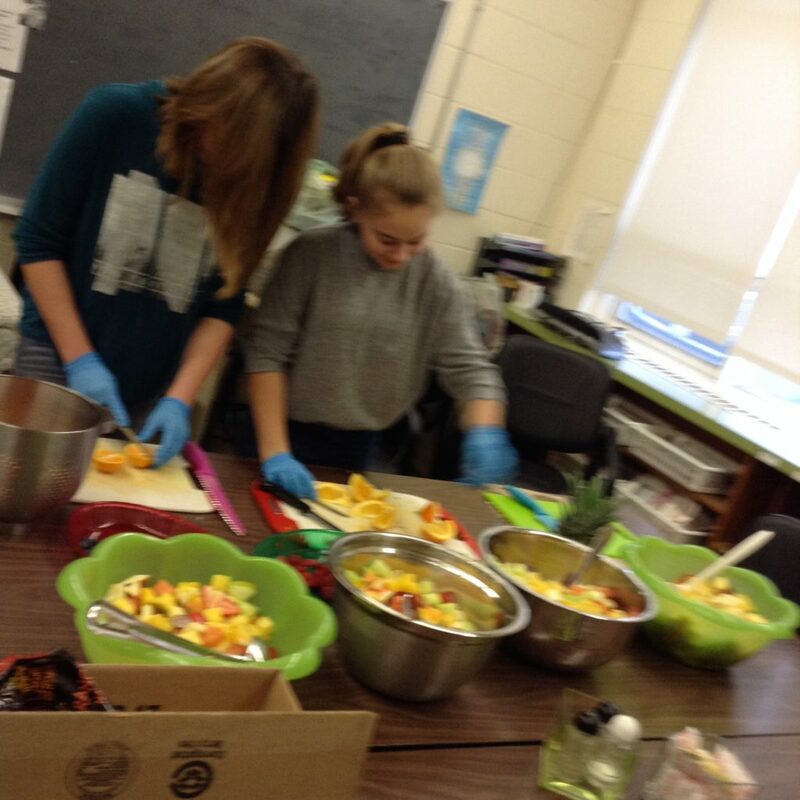 Muskies brought in a fruit today and some of our Muskies did an amazing job at making fruit salads. 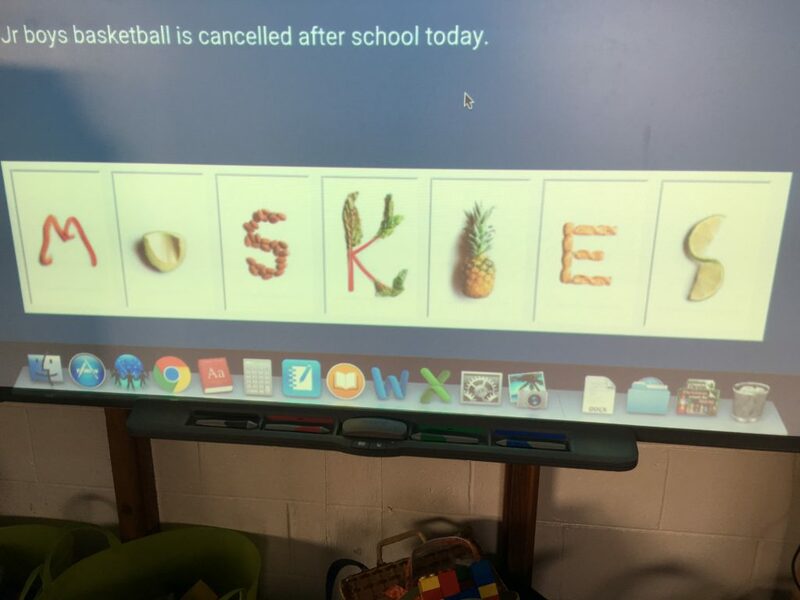 It was gobbled up in no time by the students. What a great way to get top nutrients in a glass! 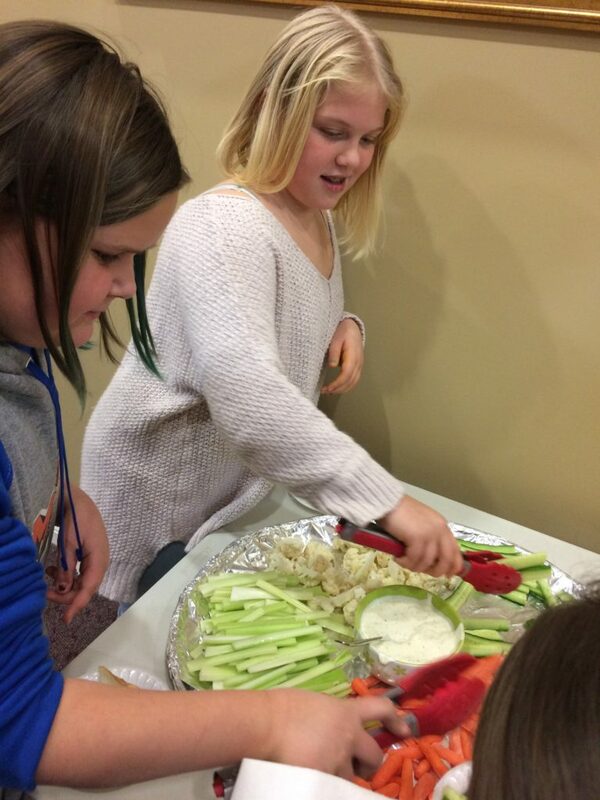 Thank you to all our Muskies for contributing to this healthy snack and to our chopping chefs for making it! Murray Muskies enjoyed a healthy turkey luncheon with all the trimmings. A medley of nutritious vegetables was also served. The grade 7/8 did a super job serving everyone. Thank you staff and Parents for making that all happen!! 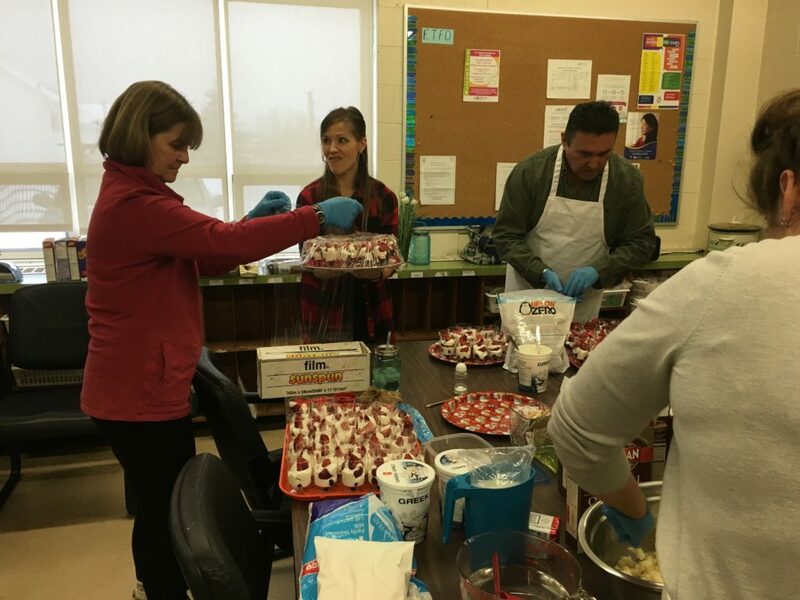 Keeping up with the festive season the students were served berry yogurt parfaits made by some parent volunteers. The red strawberries on top looked like Santa’s hat. The students loved the nutritious snack. Thank you volunteers! 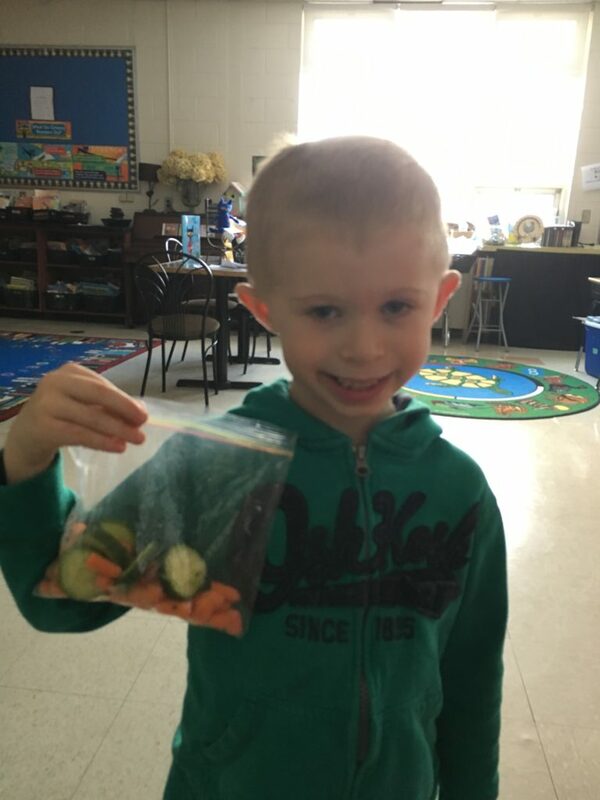 Well one of our Muskies proudly went around showing our Muskies in the school the bag of vegetables that he cut and packed up himself. Great example to all of us that healthy eating has taken over our school! Way to go little Muskie!!! Our Murray Muskies made an amazing effort during our food drive to exceed the target number of canned food that we could collect. Kindness is in our hearts for sure! Kids making sure that less fortunate kids have food to eat. Great job muskies we surpassed our target number! Sip Smart and Avoid the Sugar! 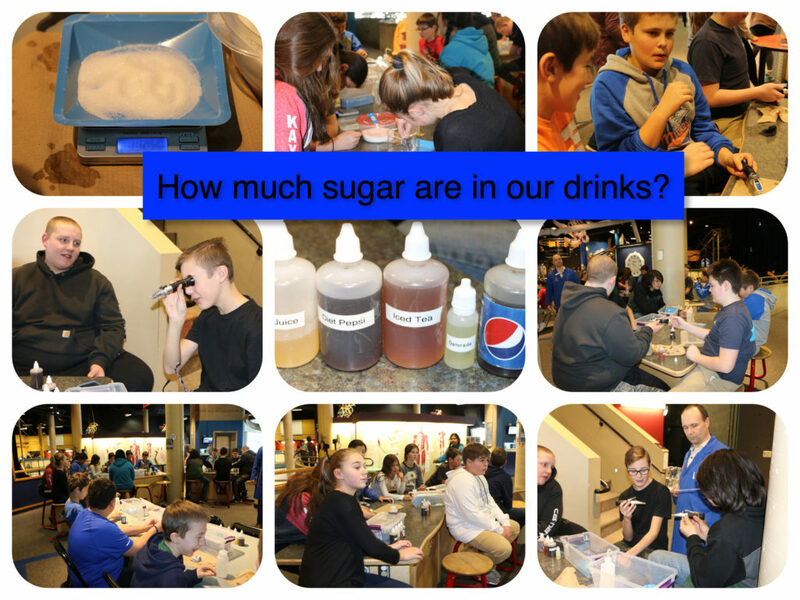 The grade 7/8 tested a variety of drinks at Science North to find out the amount of sugar in each. After finding out just how much sugar was in the drinks they all whole heartedly agreed water was the best drink of them all. H2O is at the top of their list! The JK/SK had hands on opportunity to reinforce healthy eating by learning about the Canadian Food Guide. They then sorted food on a plate while following the guide. 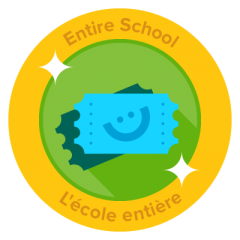 Thanks to the blue coat instructor for making this activity so much fun!!!! 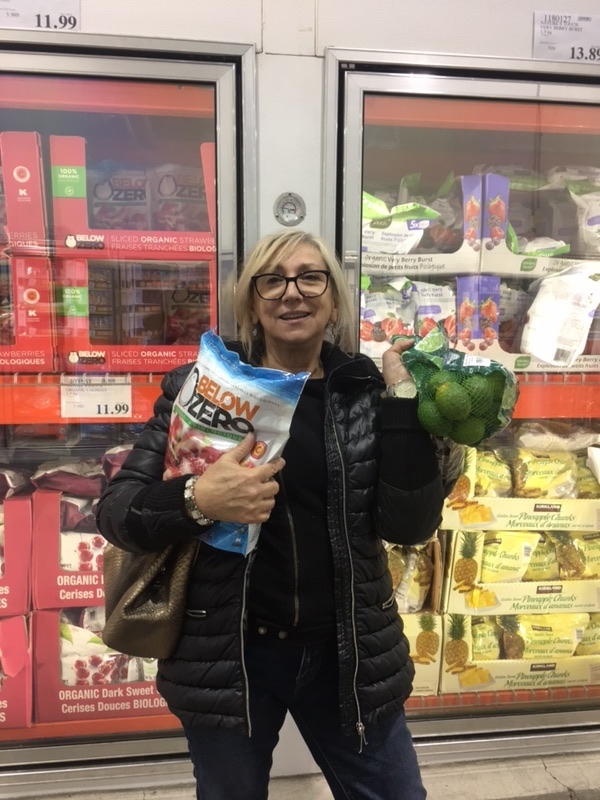 Mrs. Salo was snapped shopping for healthy treats to add some great tasting nutrition to the diets of our muskies. The healthy treats stored in the freezer and fridge send a great message to our students just how important healthy eating is. 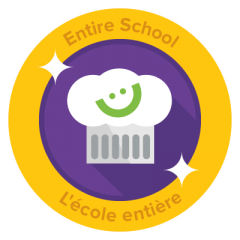 Our students are absolutely loving the nutritious cooking that is happening! Eggciting Protein with Homemade Salsa! Mr. Dewit and Mrs. Salo created an amazing healthy breakfast for the students this morning by serving scrambled egg wraps with homemade salsa. 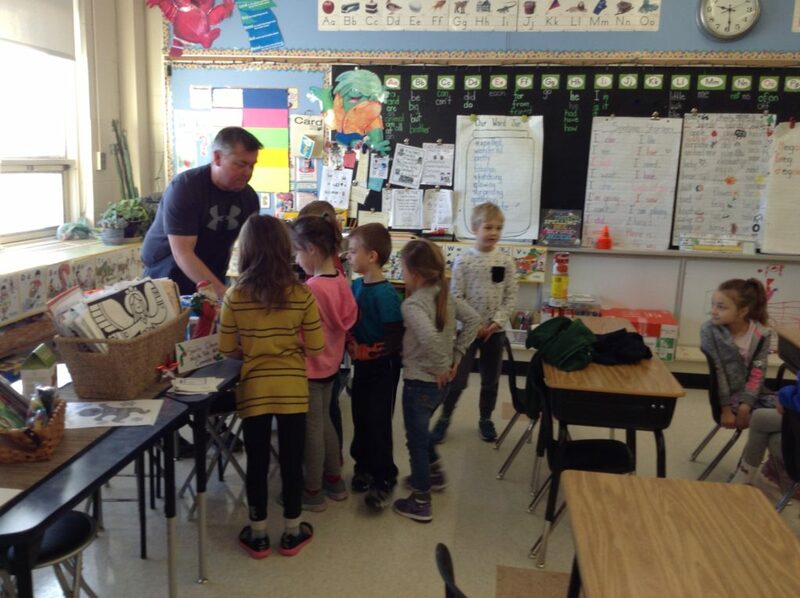 Mr. Dewit went around the classrooms with his eggciting protein cart to serve the yummy wraps. Seconds were had by many students! Students loved the grated cheese and even the minced onions on the side were a hit! Can you believe it? Healthy eating has made it into our Joke of the Day! Students enjoyed a chuckle this morning when they read the Joke of the Day! More chuckles to come!!!!! Yesterday during our snow day the few muskies that were at school were treated to a veggie friend platter and dip after coming in from playing outside. If you look closely, you can see the facial features along with the brain of our friend to remind them eating healthy creates a healthy brain. Yep, they enjoyed the healthy tray! 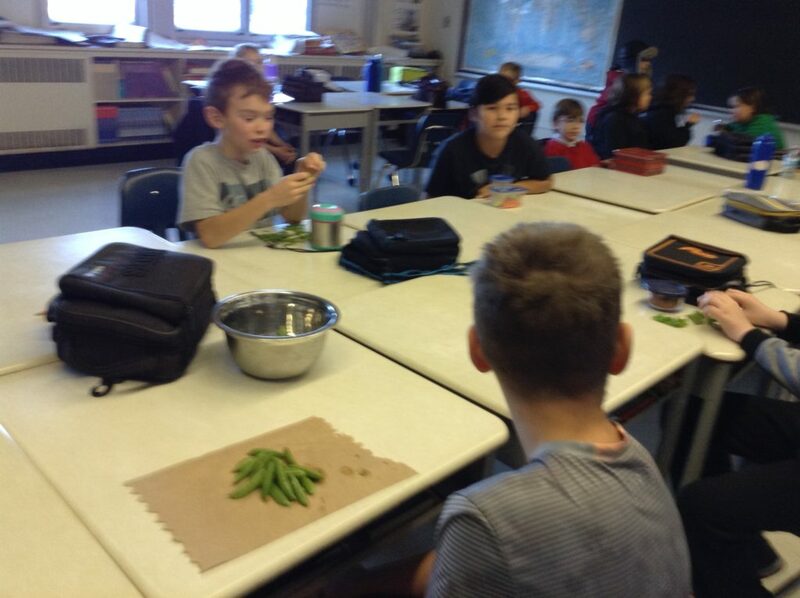 Our Muskies enjoyed shelling peas and eating the little pearly greens! One more veggie to add to our wanted list! 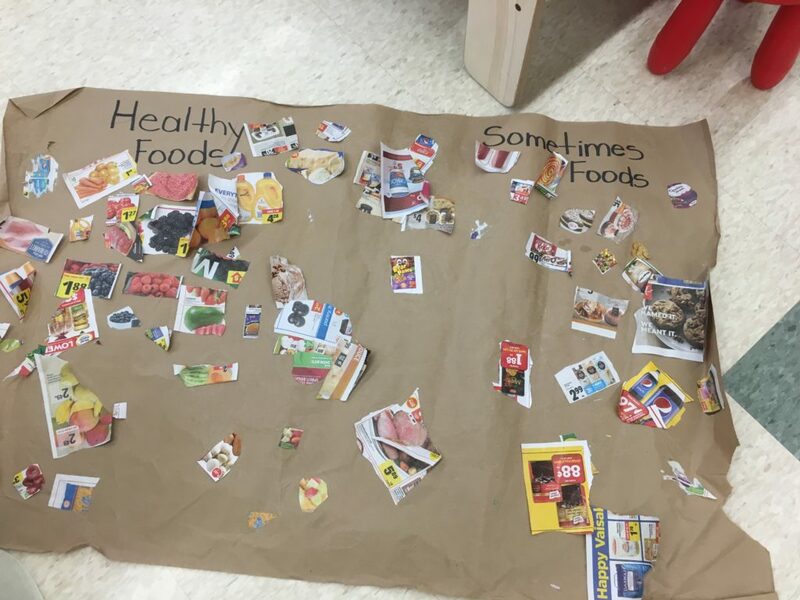 The ELK class did a super job at cutting and sorting pictures of healthy foods and sometimes foods. 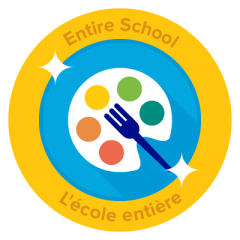 Their mural reflected their continuous learning of eating to be healthy! The ELK class were busy shopping to pack a healthy lunch. Different play food was made available for them to fill their shopping basket. They did a super job at selecting the correct items to pack to make a nutritious lunch. A great hands-on learning activity for our little muskies! Murray Muskies brought in some veggies to create salads today. 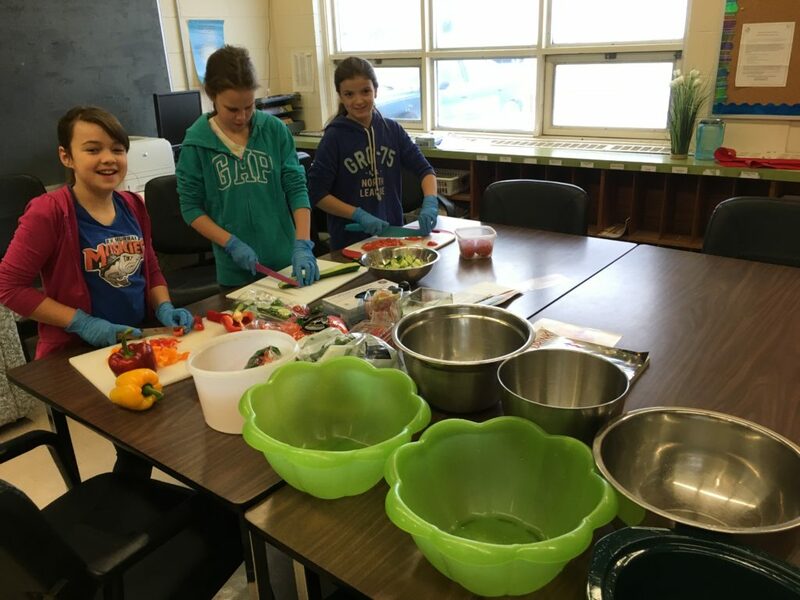 Some grade 5/6 students helped Mrs. Salo prepare a bowl for each class. It was a big hit! The OPHEA club was happy to see that their survey with activities to increase everyone’s healthy nutrition intake is taking place. Murray Muskies have a very active OPHEA club. The club conducted a school wide survey to find out what students felt were the important contributors to good health and what activities could be done to improve everyone’s health. Nice to see that more healthy nutrition was on the list. Students came up with some great ideas to make that all happen! Great job OPHEA club! The Intermediate Girls Volleyball team battled it out on the courts for the RDSB Division A Championships on Monday. 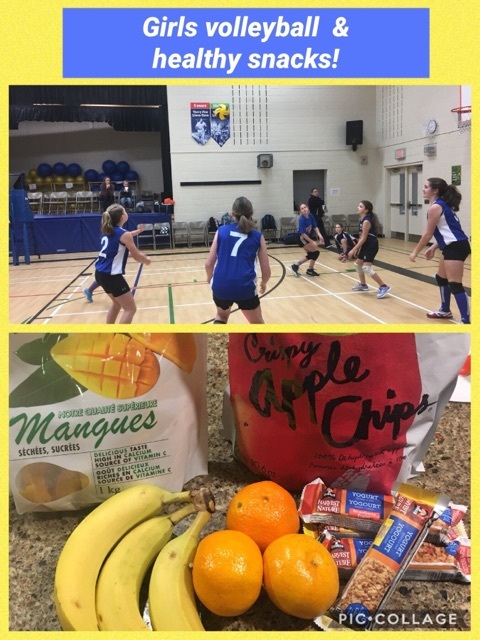 Off the court, the girls were provided with healthy snacks to keep them energized for their games and encouraged to drink plenty of water, instead of sports drinks or juice. Way to go girls! The intermediate Muskies paired off with the mini-muskies to create short videos about healthy eating. The engagement was phenomenal. Lots of laughs and retakes but the messages about eating healthy foods hit home. These videos will be used during our morning messages. Great bright idea tech buddies! Students had to guess the fruits and vegetables displayed on the table. The prize was a handmade crown made by Mrs. Neva for the students that had written the correct answers on their guess ballot. Grades 1-8 were involved in the guessing contest. Some of the food items were a pomelo, avocado, Christmas melon, dragon fruit, mango, coconut, bean sprouts, zucchini, leek, lemon, lime, black plum, hot pepper, and cucumber. Afterwards students got to have a sample taste of all these goodies. Bravo Mrs. Neva for thinking of this bright idea. You’ve Been Snapped Eating Your Fruits and Veggies! 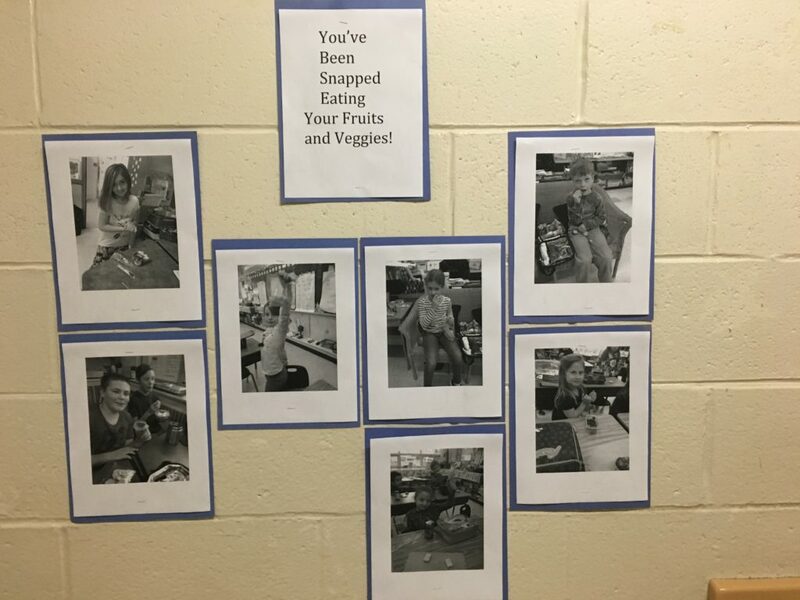 Mrs. Salo has been snapping pictures of our eager Muskies chomping on some fruits and veggies from their lunches. A display of pictures snapped has begun in our hallway wall by a fountain. Keep chomping away Muskies!!!! 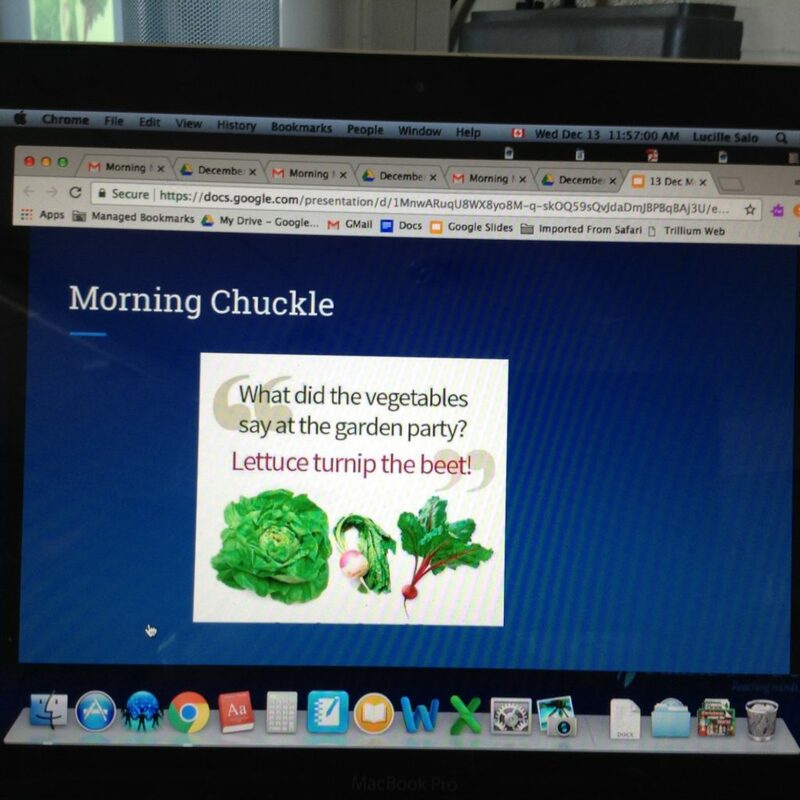 Veggies and Fruits Up to Mrs. Neva! Every morning our students are seeing Muskies written with fruits and vegetables in our morning announcements. That is delivering the morning announcements by stating the effort we are putting in having a better diet. Murray Muskies you can keep eating your fruits and vegetables! 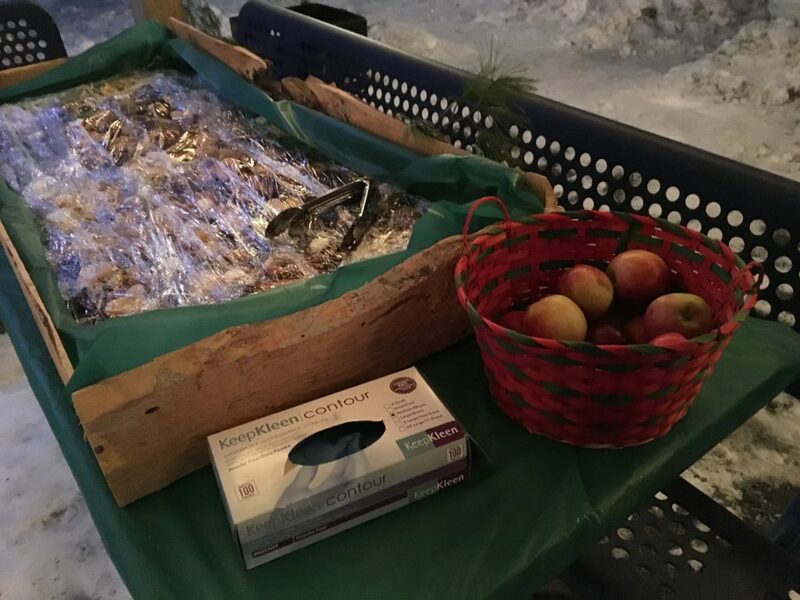 Murray Muskies came out of Sparks this morning to be greeted by an apple cart. One of our students was at the exit door with the cart and a sign which our students made a point to read. And you guess every last one disappeared! R.H. Murray is part of the Northern Fruit and Vegetable Program which provides an array of healthy vegetables and fruits to our Murray Muskies. Our Students look forward to all those healthy treats! One of our students was awarded some Sudbury Wolves tickets for her fantastic daily participation during our Sparks program. 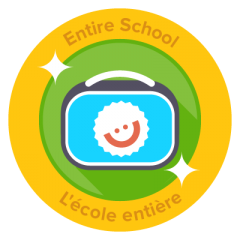 Another great way to reward our students without the use of food! Great thinking Mr. Dewit! 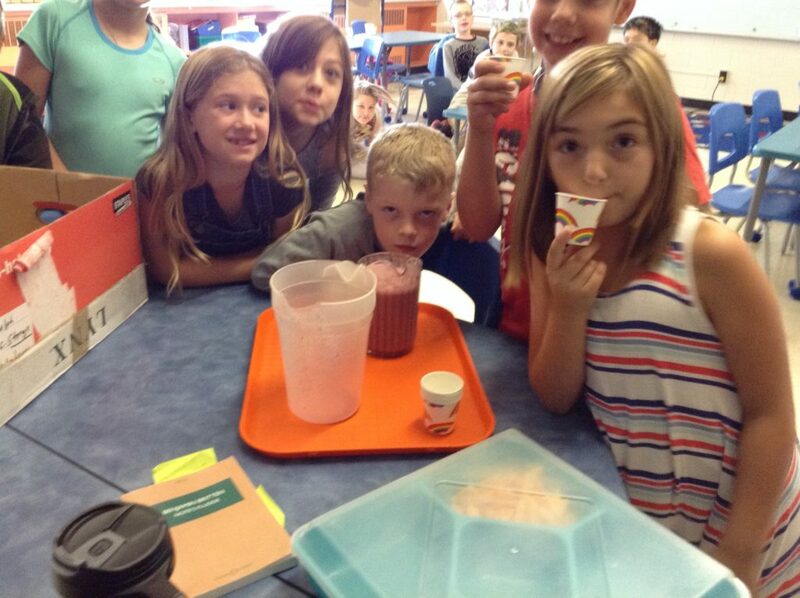 The Grade 1/2 students in Mrs. Salo’s class used leftover frozen fruits from our smoothies to learn about the states of matter. Delicious fruits in juice became solid matter. of course the students enjoyed the tasty healthy treats! No edible sweet treats in this jar! 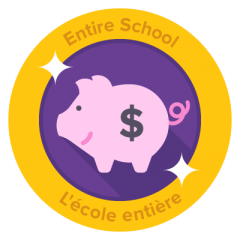 Mme Janine ran an estimation contest and she placed animal erasers instead of sweet Halloween treats in the estimation jar. Big hit and there was a winner! 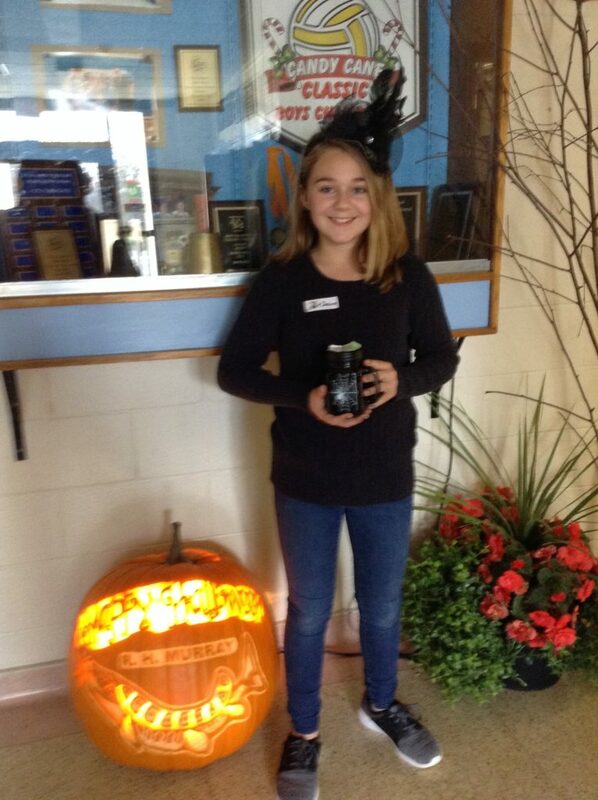 Yesterday Halloween was celebrated at R.H. Murray P.S. 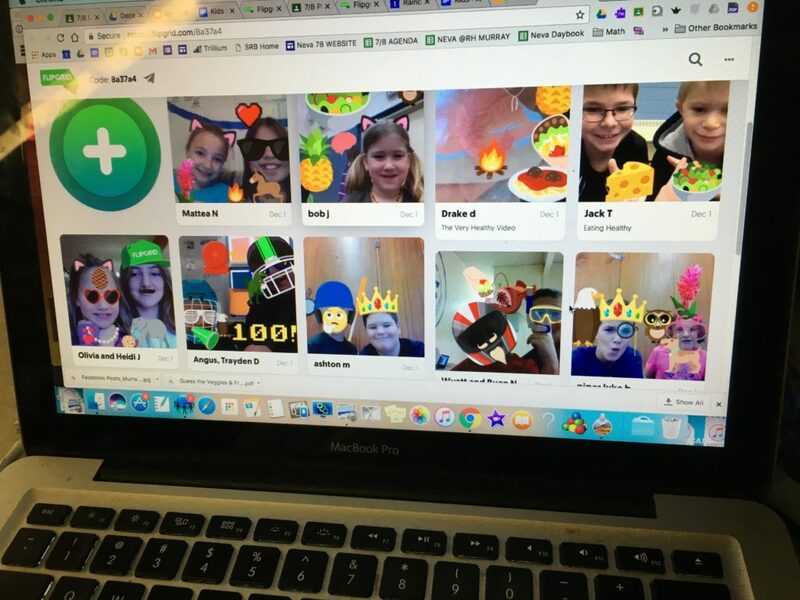 by having fun stations in different classrooms. 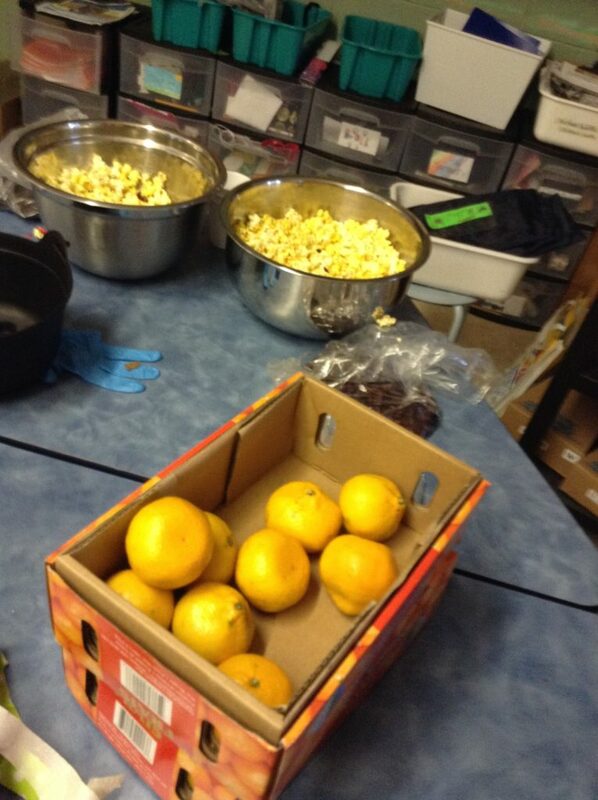 Murray Muskies enjoyed popcorn and oranges as healthy treats at the Yummy station. Special recognition is given to Ms. Shell for arranging these yummies in her class. Everyone had a spooktacular great time! Great surprise for the staff today as Mr. Dewit our principal adorned with his apron went about the school with a most delicious and nutritious snack platter to demonstrate his appreciation for his staff. Meetings and events will never be the same! Only healthy snacks for his staff! You rock Mr. Dewit!!!! The R.H. Murray 7/8 class has been transformed into a pleasant socializing environment. There are many comfortable flexible seats that gives the room a Starbucks feeling. 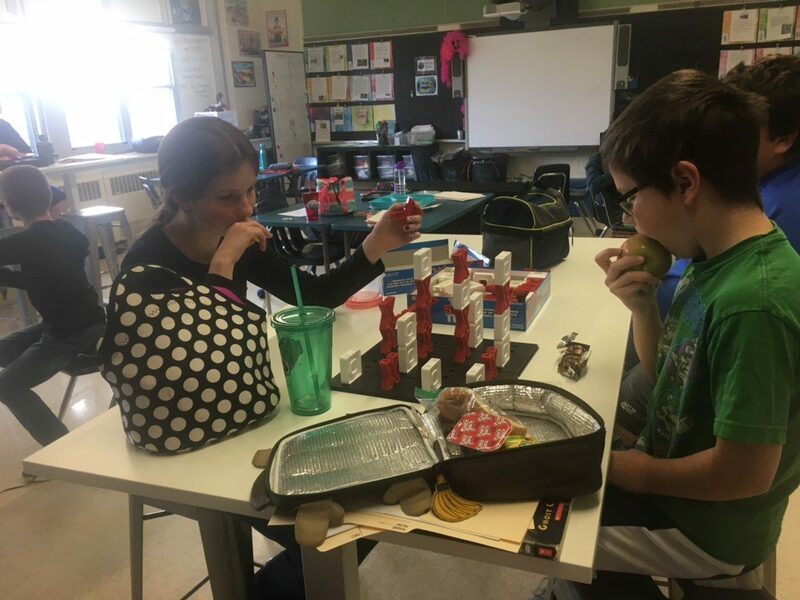 Students are engaged with playing different games while eating their lunches. 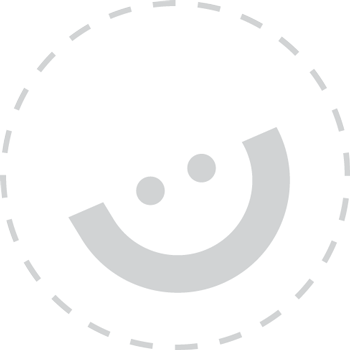 Music is also available to further their enjoyment of chilling out together and eating the healthy lunches packed with punch that they have been bringing. 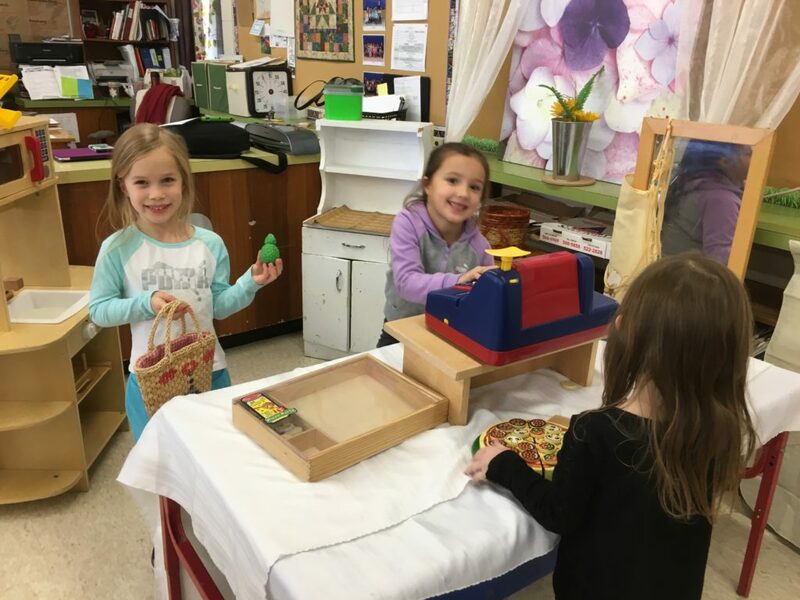 The kindergarten class has created a Friendship Table in the hall. 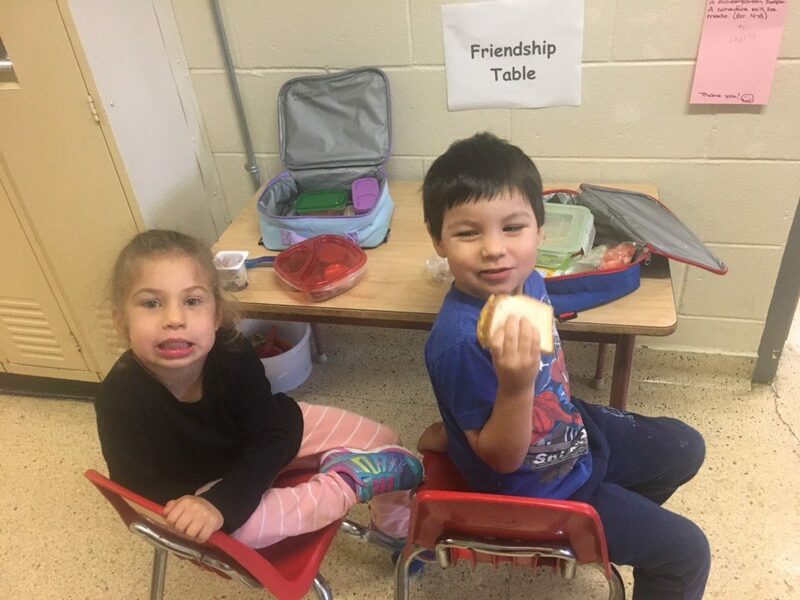 Students are choosing to sit together during nutrition breaks while sharing some great talk and eating their nutritious lunch. We have seen a real turn around with the lunches that the students are packing. Enjoying good food and friendship goes hand in hand! Way to go Mrs. Oshell!! We continue to promote drinking water instead of sugared drinks. We have sent electronically the Sip Smart poster to all our families to encourage students to drink water at home and at school. 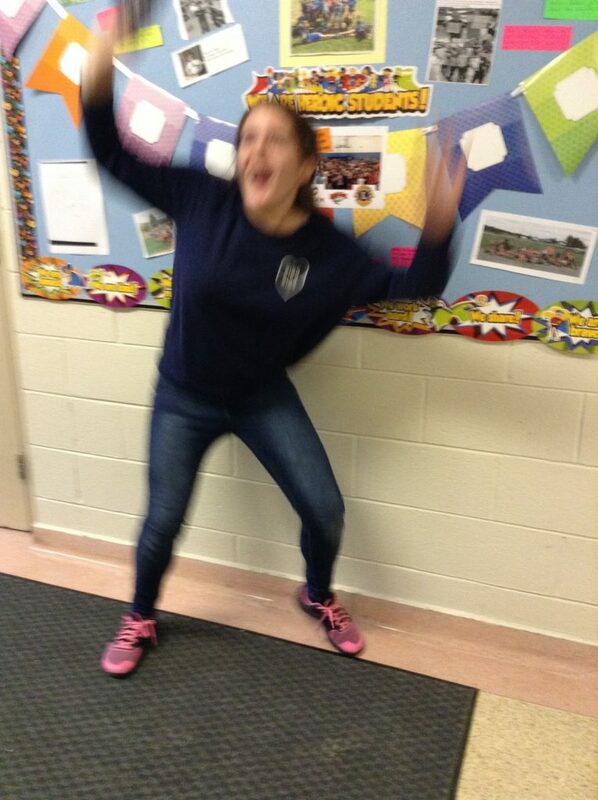 Drinking water at school is cool!!!! 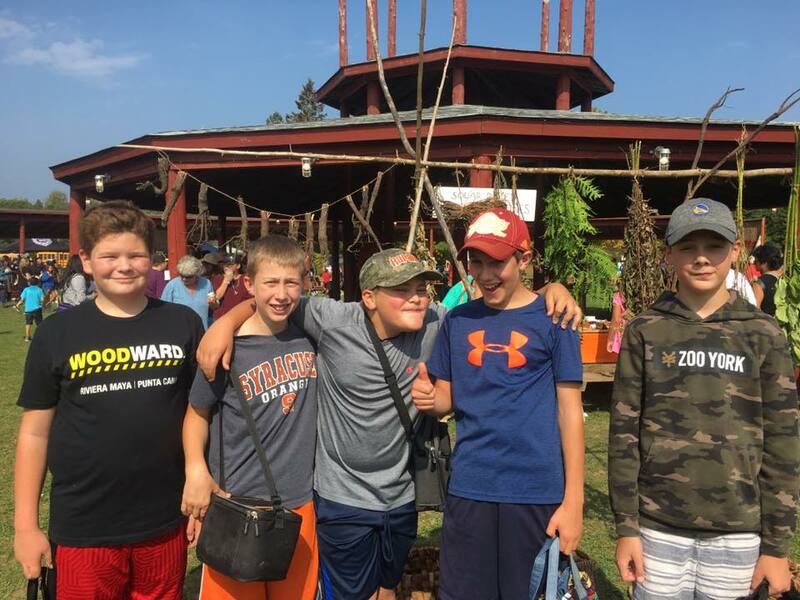 On September 17, the Grade 5-8 students travelled to M’Chigeeng on Manitoulin Island to participate in the Annual Kenjgewin Teg’s Fall Harvest. 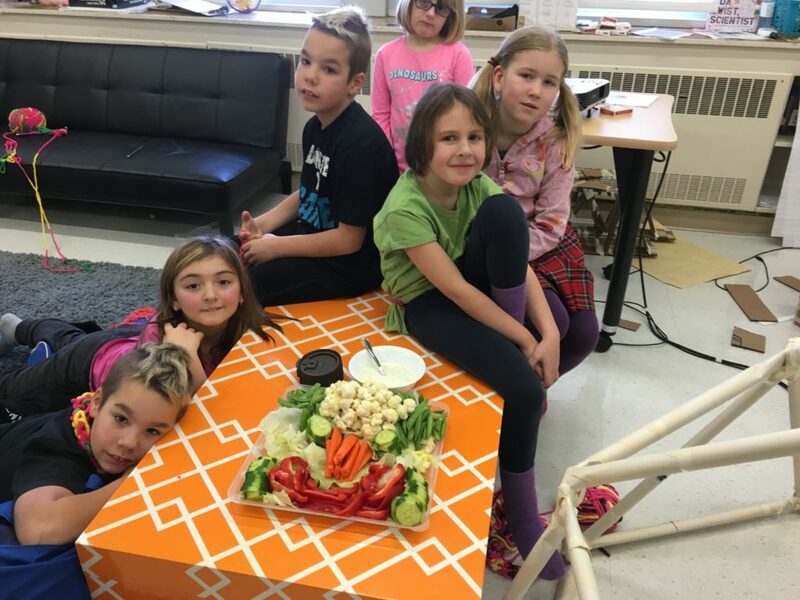 Students and staff learned about the many vegetables, fruits, and other native plants that are harvested and traditionally prepared in Northern Ontario. 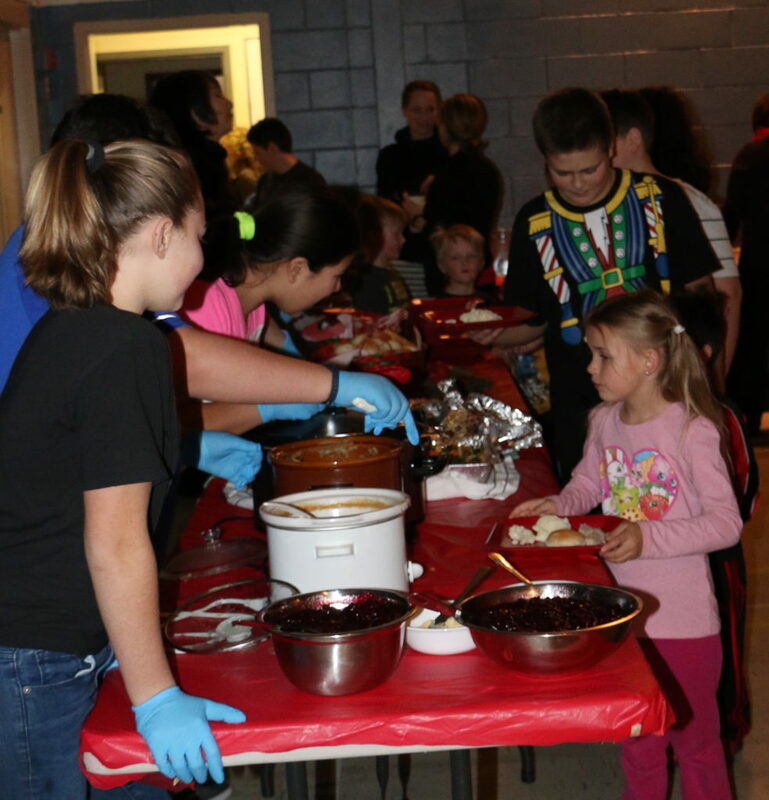 They tried many prepared foods with pumpkin, apple, rhubarb, corn, beets, tomatoes, and carrots. Some even tried the scones, drinking cedar tea, and eating deer meat. Orange Ya Glad It’s Monday! Orange is the colour of the day today and oranges were the flavour of the day. 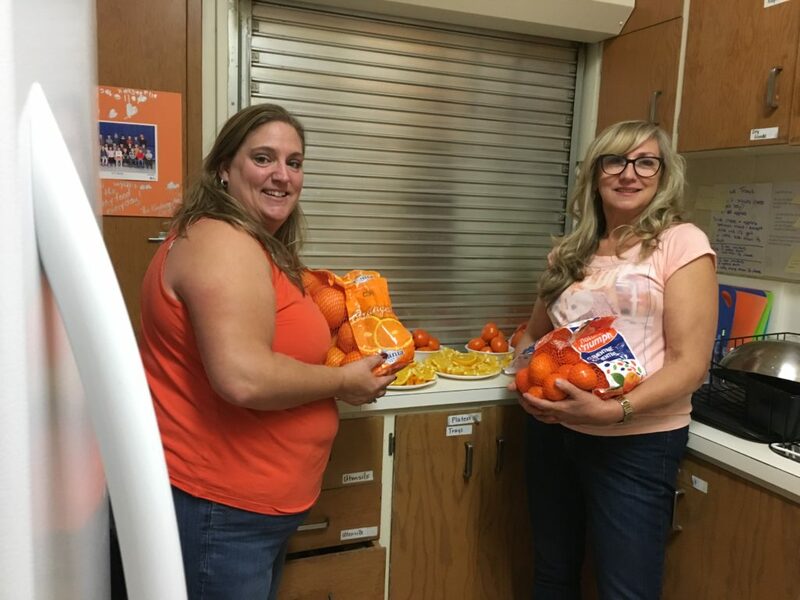 Students and staff wore orange and classes received oranges for their students to snack on this morning. Of course they were a big hit. Thanks to Mrs. Neva and Mrs. Salo for serving this high vitamin c fruit to our students. Grow it and they will eat it! 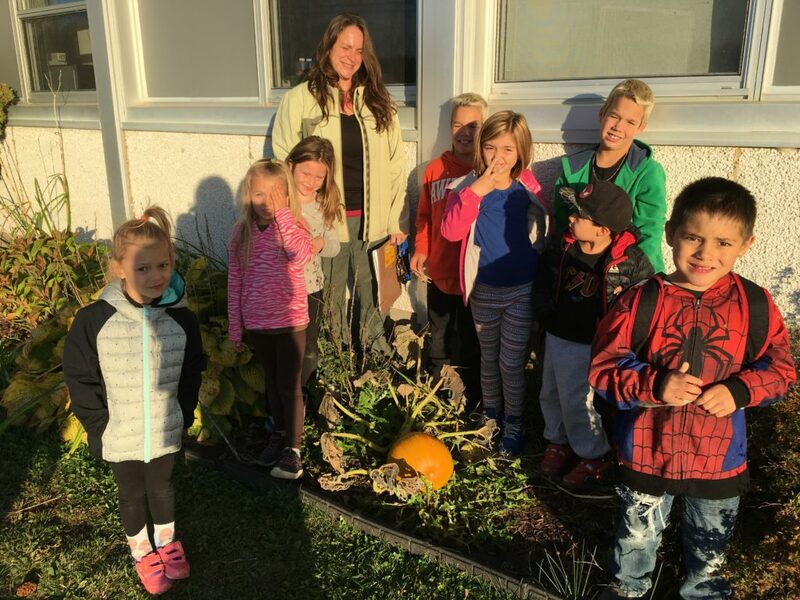 Miss Julie and her munchkins grew a pumpkin in our front flower bed. Today is the big harvest. They are baking the pumpkin and they intend to make pumpkin soup and muffins. What a great way to paint some plates and develop those taste buds while promoting yummy veggies and fruits! 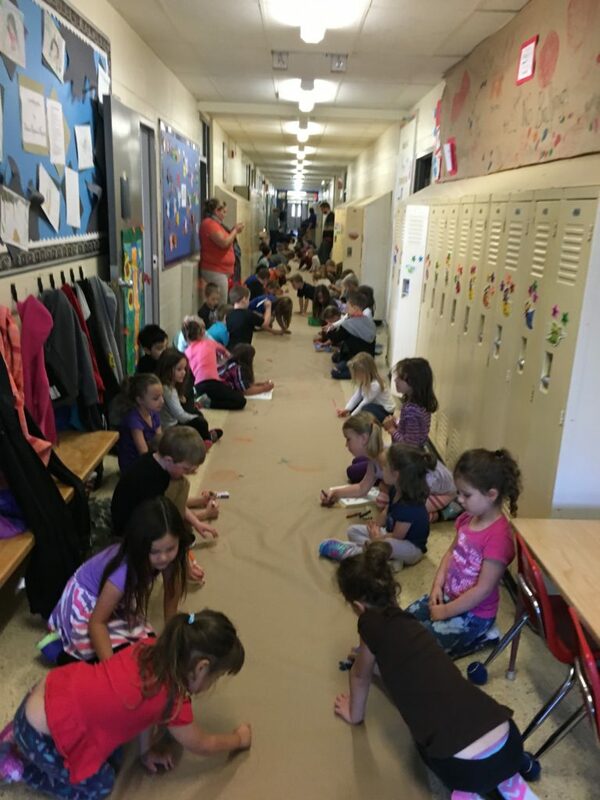 Our Murray Muskies gathered in the hall this morning to create a ” Eat Healthy, Feel Great ” banner. Some very colourful fabulous ideas created an inspiring message to remind us to eat healthy on a daily basis. The banner will find its place on our gym wall. Yes an “Eat Healthy, Feel Great” wave has washed up on the shores of our school! Great job Murray Muskies! 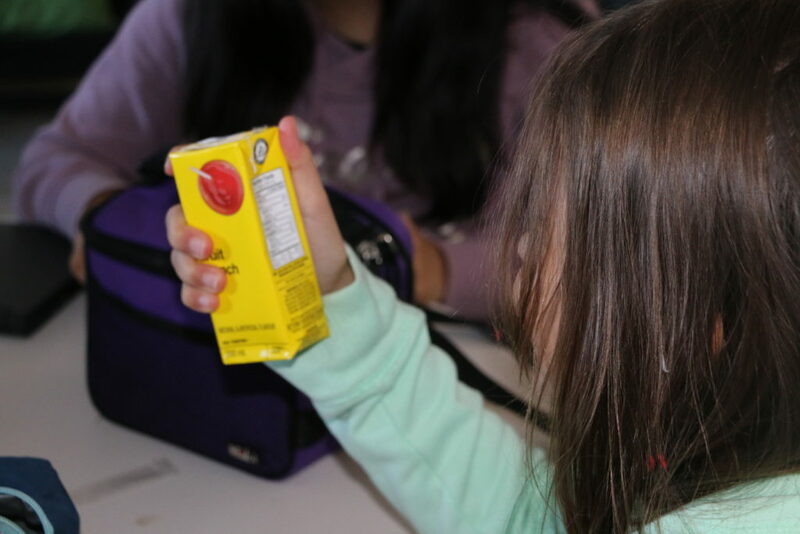 This week is “Pack A Lunch With Punch.” Students are trying their best to bring to school a nutritious lunch keeping in mind that eating healthy will make us feel great. Special thanks to our families for filling up the students lunches with nutritious foods! 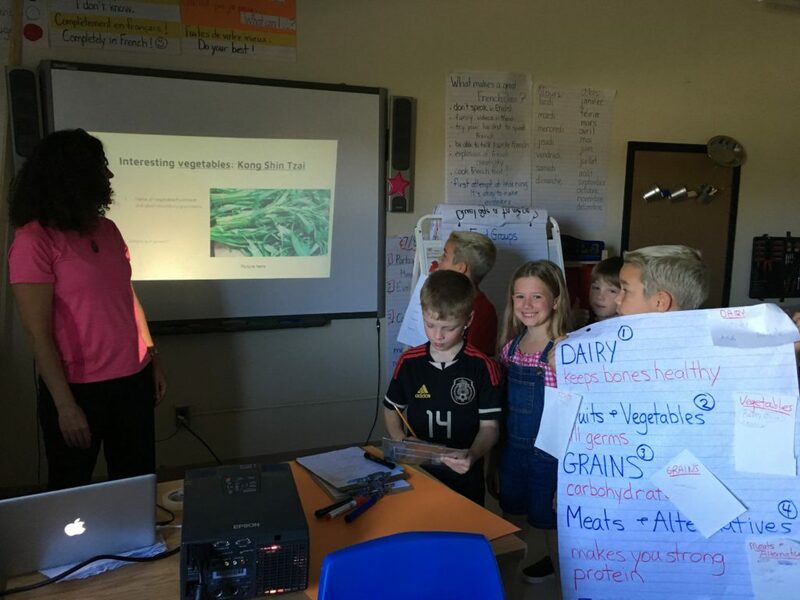 Zesty lessons for healthy eating through the Ontario Health and Physical Education curriculum are highlighted in Mrs. Hamilton’s class by using slide shows created by the students. 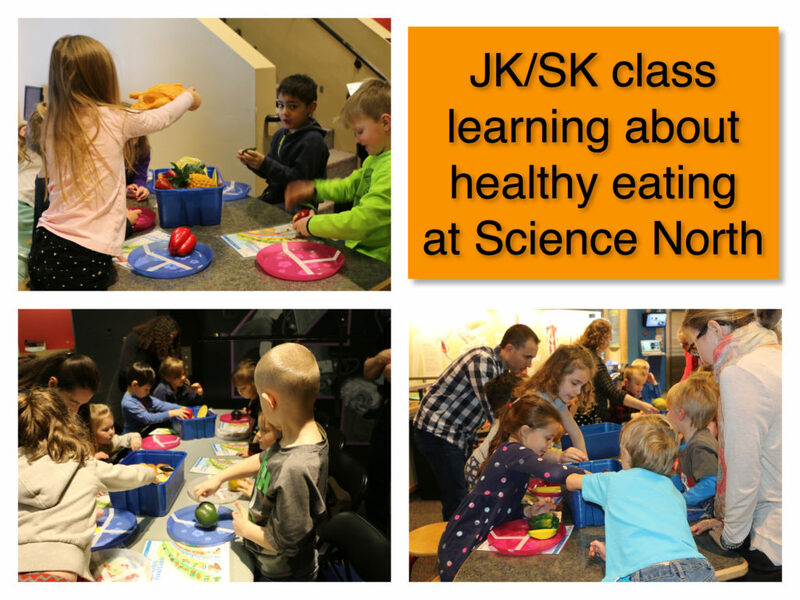 Students are using vegetables and fruits from around the world to learn more about the many different kinds of nutritious foods that exist to create the food groups and support that encourages healthy eating! A great way to diversify Murray Muskies’ healthy tastebuds. Way to go Mrs. Hamilton and students! 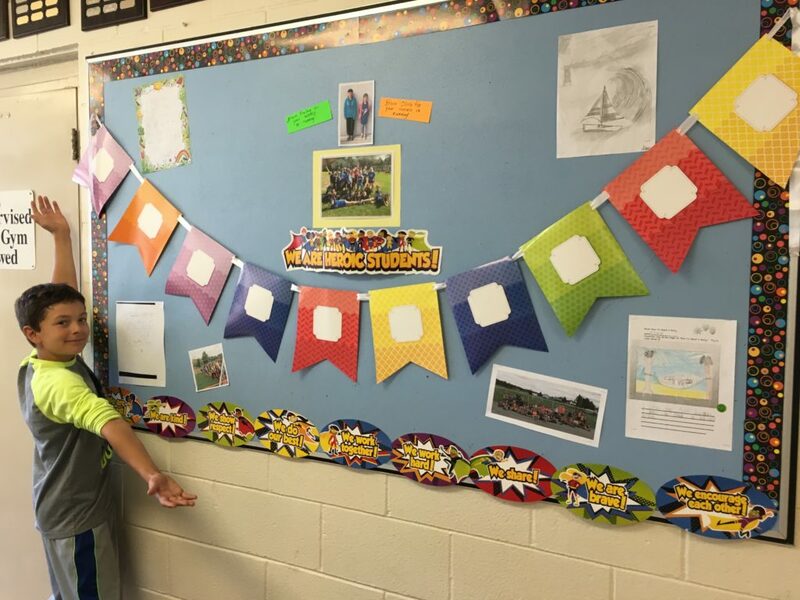 A bulletin board to celebrate the success of students has been created by the school office by rewarding achievement and success with positive statements, physical activity and non-food rewards. 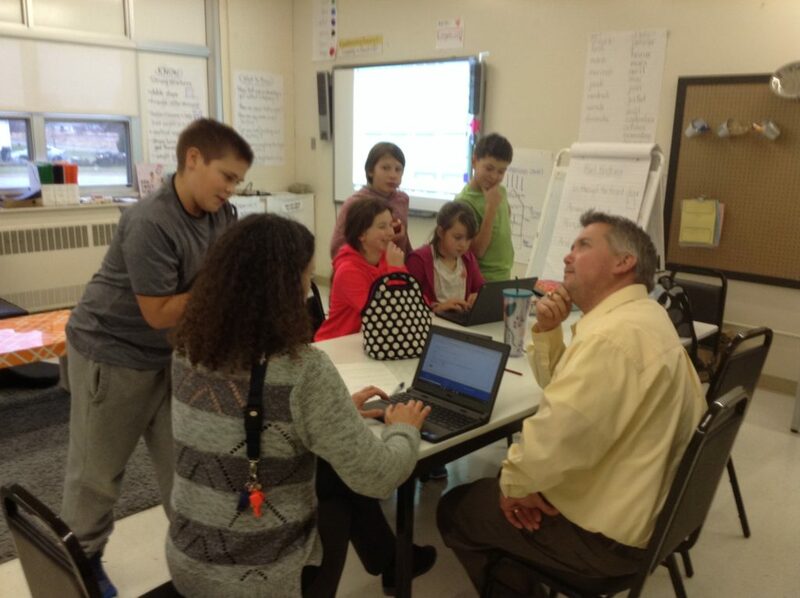 Students are excited about the positive feedback that they are getting. Cheers can be heard in the hallways when success is highlighted during the morning announcements. Go Muskies! Go!!! 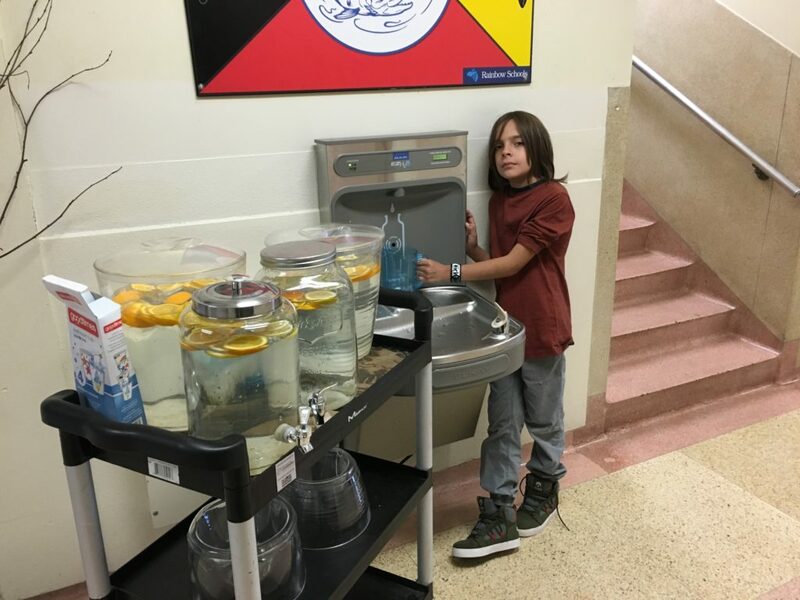 H2O Water Day happened at R.H. Murray P.S. yesterday. 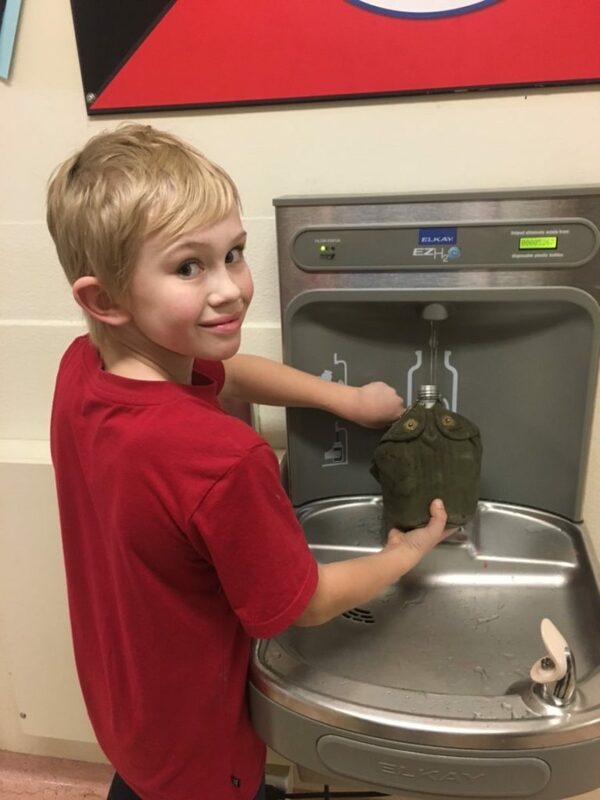 Water stations were set up in classrooms. Sliced lemons and oranges added to the flavour and the appeal of this sugarless drink. Students arrived at school with containers of water brought from home. Morning announcements included the important message of drinking lots of water. The plan is to continue to use Sip Smart Ontario key messages in our morning announcements weekly to encourage water as always being a great drinking choice. Carrot chips anyone? Fresh carrot chips have been added to the weekly pizza menu. Murray Muskies totally chomped down on this most nutritious snack. They were in demand the following day. A keeper for sure! Smoothie Fridays have perked up the nutrition in our Murray Muskies. 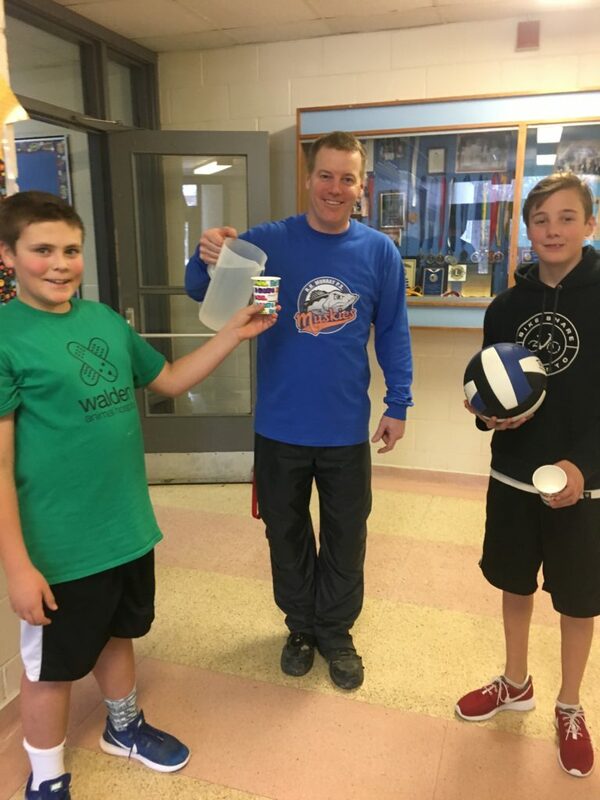 After an energizing Spark workout with Mr. Dewit students were greeted back into their classroom with smoothies. Students were asked to bring a fruit and the smoothies were made with the generous donations brought by our muskies. Guaranteed to be on the menu again! The grade 7/8 started the year on water is the drink choice of the day! 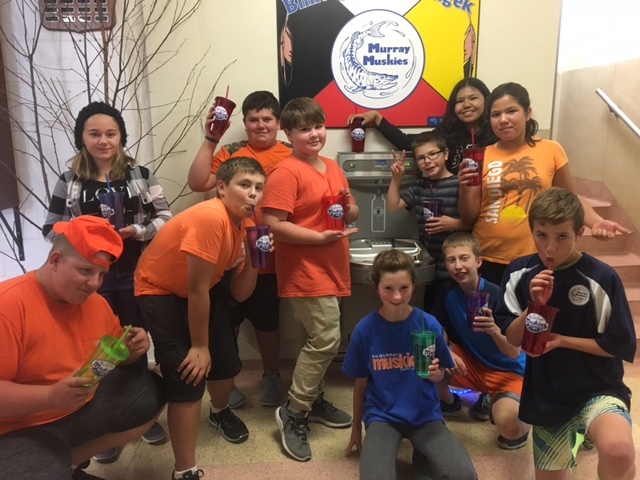 On the first day of school Murray Muskies cups were given to students to promote water as their drinking choice. Students can be seen daily at the water fountain filling up their cups. 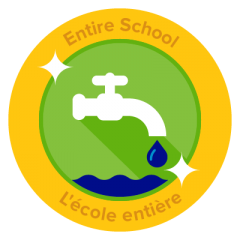 All our students are encouraged daily to drink lots of water from our water filtered fountain. Students are reminded daily to avoid sugary drinks. Bravo Mrs. Neva for this super idea!! R.H. Murray P.S. continues to find alternative ways to do our fundraising. 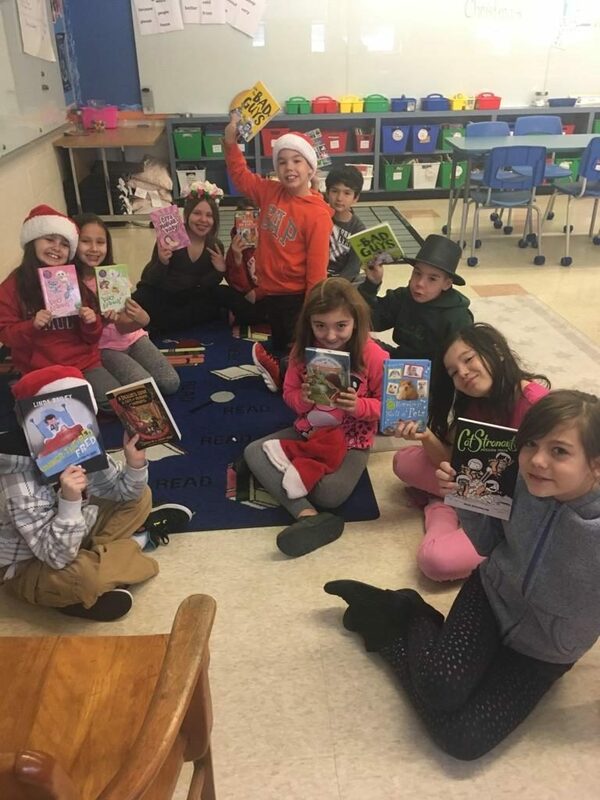 Some of our fundraising efforts include Nevada tickets, school photos, pizza kits, spaghetti diner, fall and spring slow pitch tournaments, cross-country fall race, West Jet raffle tickets, spring theme gift baskets, healthy popcorn snacks, and milk sales. Water bottles are also sold at all our events. 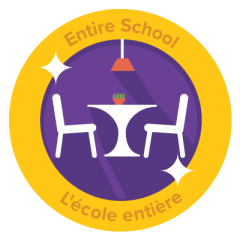 We are hoping to progress even more in switching to non-food or nutritious food only as fundraisers to send the correct message to our students. The primary students at R.H. Murray P.S. were treated to a Harvest Lunch directed by Leigh Anne Cecchetto from “Cultivate Your Neighbourhood”. 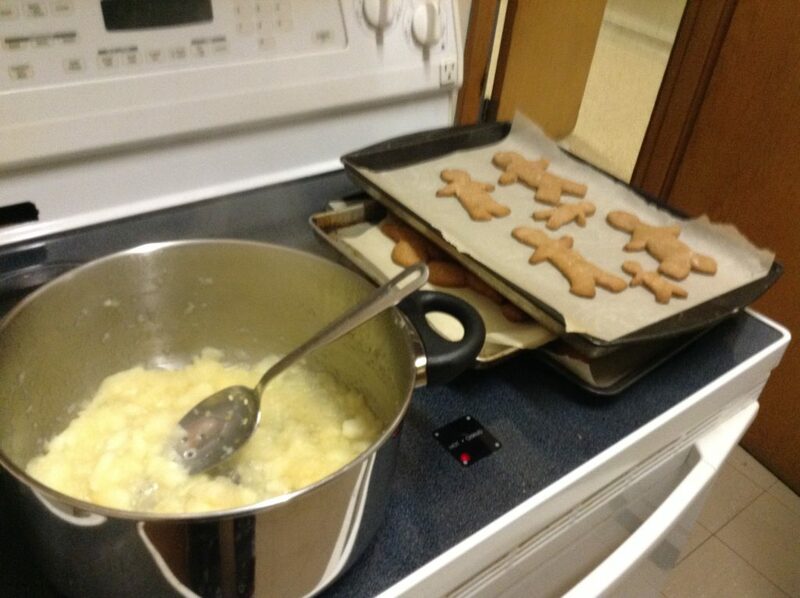 Students participated in preparing a vegetable soup and biscuits. 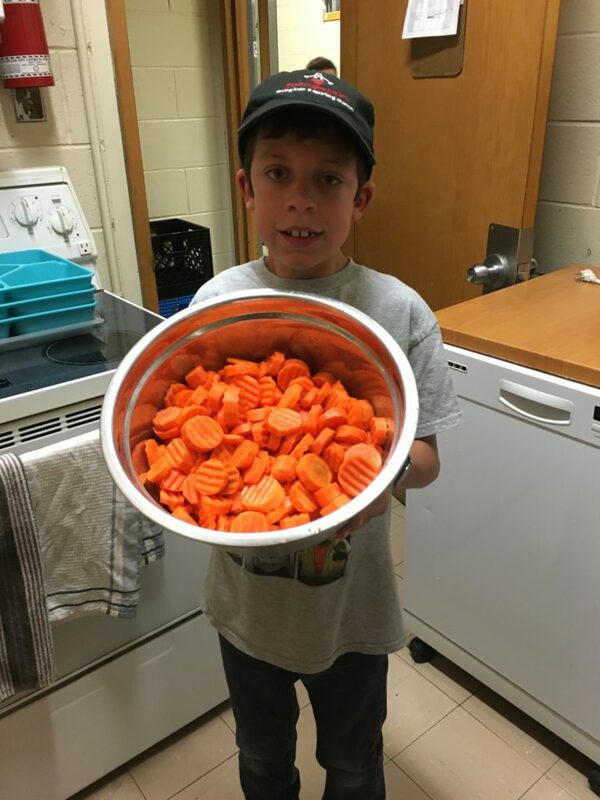 Students cut up carrots, beans, and celery. They also enjoyed cucumbers, tomatoes, and kohlrabi from our own vegetable bed. Ah and dessert was fruit salsa and cinnamon lightly sprinkled sugar tortillas! Wholesome and nutritious feast for our Murray Muskies. Thank you chef Leigh Anne Cecchetto! 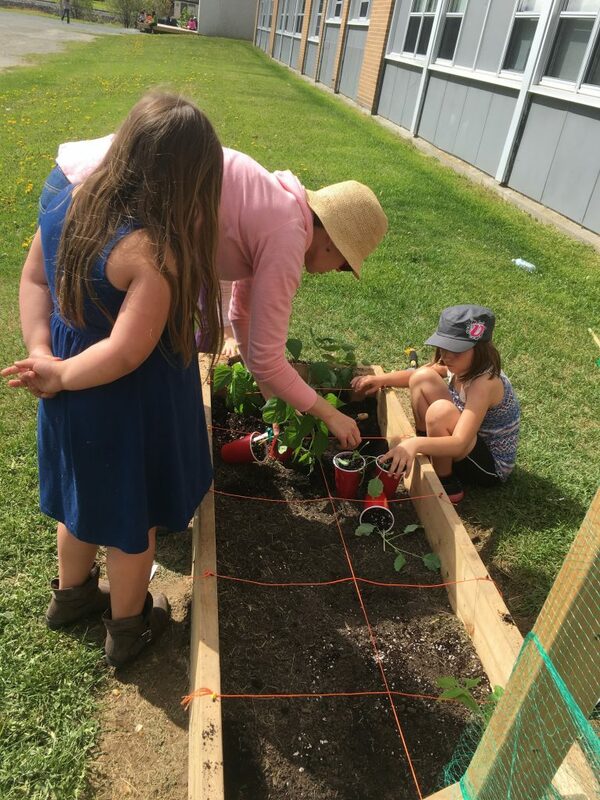 Murray primary grade Muskies planted a vegetable and a butterfly flower bed. We grew and harvested cucumbers, tomatoes, kohlrabi, and green beans. We received help from Leigh Anne from the program “Cultivate your Neighbourhood” for visiting our school and spiriting the planting project. Special thanks to our principal Mr. Dewit for constructing our vegetable bed! The students looked forward to seeing the weekly progress of our gardens and harvesting the yummy produces. Thank you Leigh Anne Cecchetto! 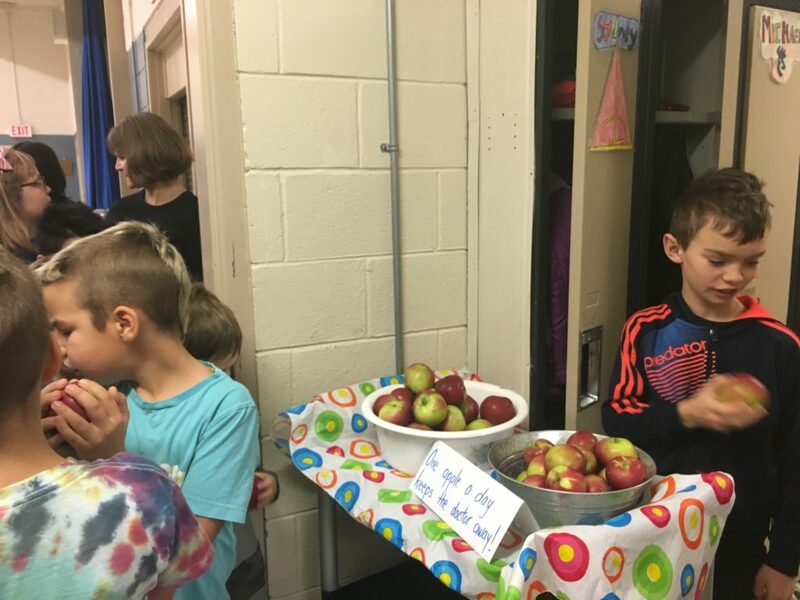 Murray Muskies are greeted each morning with a healthy snack program which gives them the opportunity to choose from a tray of healthy goodies. Students look forward to that extra nutritious snack at school.